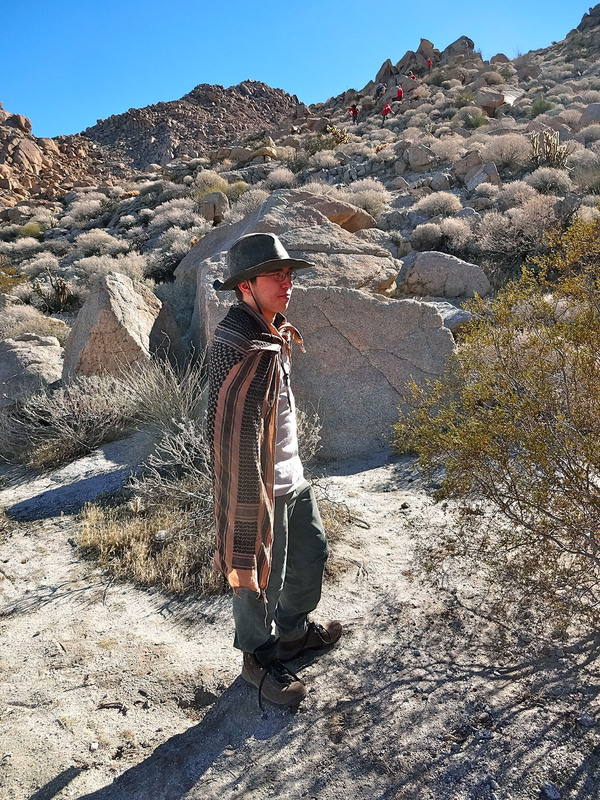 Apparently I have been living under the mistaken impression that when camping in the Anza Borrego Desert in the fall and winter, the weather is pretty cooperative. We have had a few showers here and there, but in general, we have not been assaulted by the forces of nature on trips with Sam’s Boy Scout troop. This era has now come to an end for me. 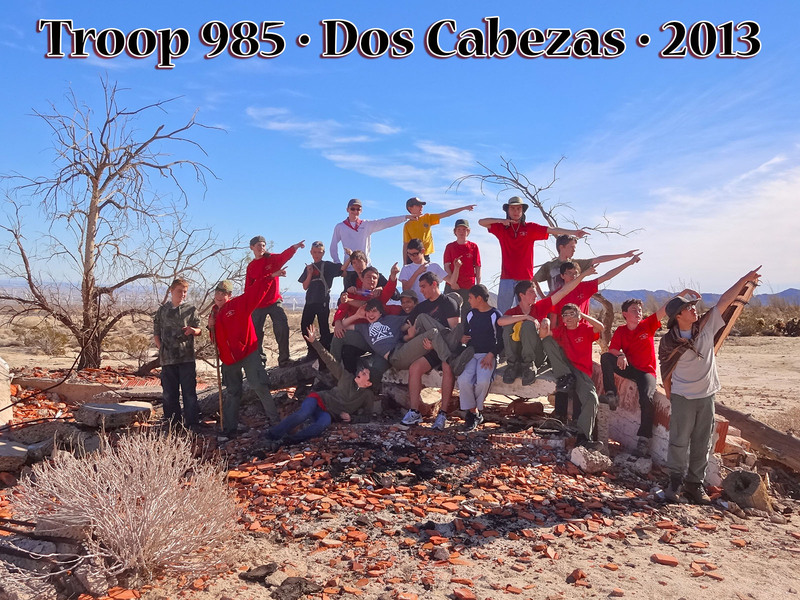 A few weeks ago we headed out on our annual troop trip to Dos Cabezas, a primitive camping site near the town of Ocotillo. The lack of facilities doesn’t bother me. I can always find a bush or friendly rock to hide behind. What does bother me, it turns out, is hours and hours of gusting winds. Not that the trip was no fun. 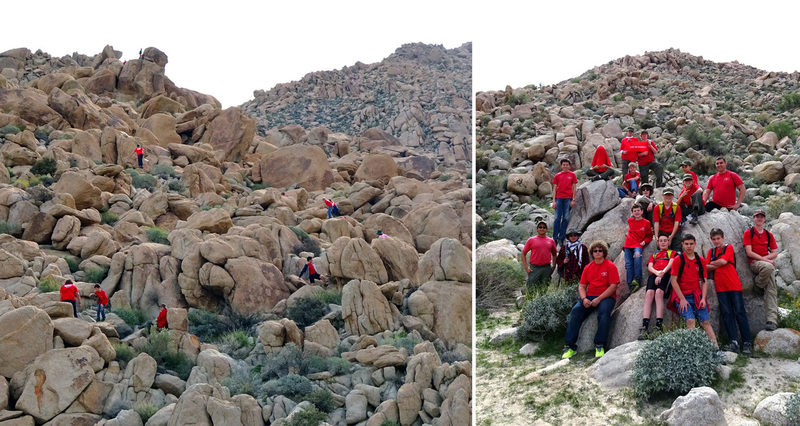 The kids had a tremendous time clambering over the boulder strewn hills surrounding our campsite. 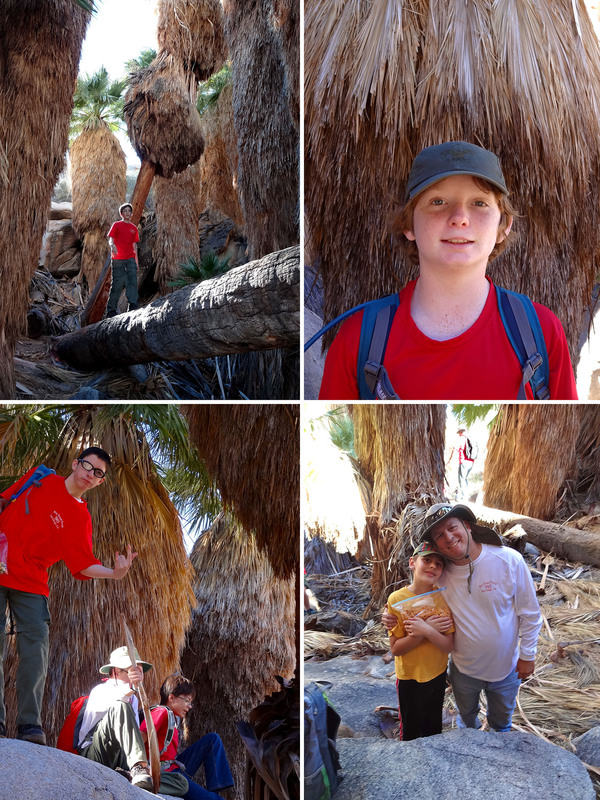 We had a great hike to the Mortero palm tree grove, we explored the ruins of the old San Diego and Arizona Eastern Railroad Company train station, and we saw the “Horse and Rider” pictograph in Piedras Grandes (believed to be one of the first of early Spanish Explorers in the area) and another set of really striking pictographs at Indian Hills. There were flowers in bloom in the desert (see my previous post Desert Flowers in Anza Borrego), and the clouds cleared up at night in time to enjoy a beautiful sky full of stars. That being said…the wind really was blowing hard. One tent came loose and was blown 30 feet in the air, and a few others lost poles and suffered tears. Many people slept in cars. I slept in a car with 3 children. We had trouble keeping the stoves lit, and while we were cooking dinner someone had to stand by holding various things down, since anything left unattended became airborne. And just the feeling of having strong winds knocking you around for 24 hours is kind of exhausting. But we are a resilient group, and despite the challenging conditions we spent lots of time chatting and laughing, and then cleaning the grit out of our teeth. We had four boys complete their First Class cooking requirements, and the scouts did a great job of cooking and cleaning together as a team. And we were graced with the presence of not just one, but two Scoutmasters Emeriti. I am glad we went, but I am hoping for balmier conditions next time we venture east! When we arrived at the site around 9:30, there was enough wind that we decided not to set up tents yet. 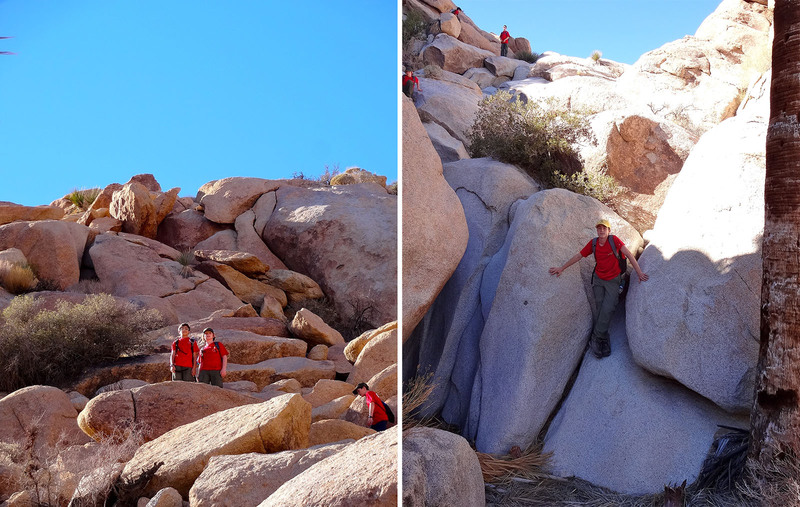 The boys clambered on the boulder strew hillsides and explored for a few hours. JD and I had fun with the panorama setting on my camera. He ran behind me while I panned so he could be in the picture twice. After lunch we set off to the Motero palm oasis. The hike up to the palms is very pretty, though I forget how steep some parts are. The palms are a great place to hang out. The trees all have skirts of dried fronds, and a large fallen palm makes a terrific bridge. Amy found a nice comfy rock chair to while away a few hours in. The canyon continues to rise up at the back of the palm oasis. There is a beautiful view down to the desert floor. The desert was pretty green (for a desert), and I loved the way the plants dotted the walls. It reminded me hanging gardens. 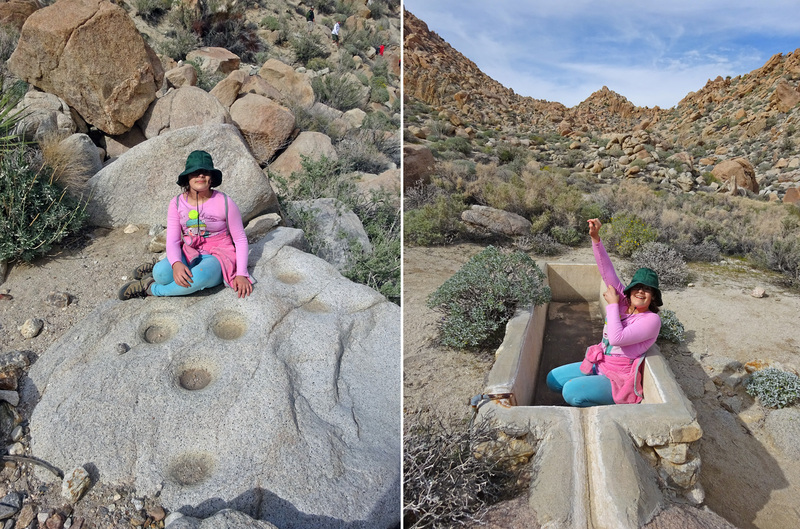 On the hike down Emma found some morteros (grinding holes created by Native Americans), and an old cattle watering trough. She is pretending to wash up with some rock soap. 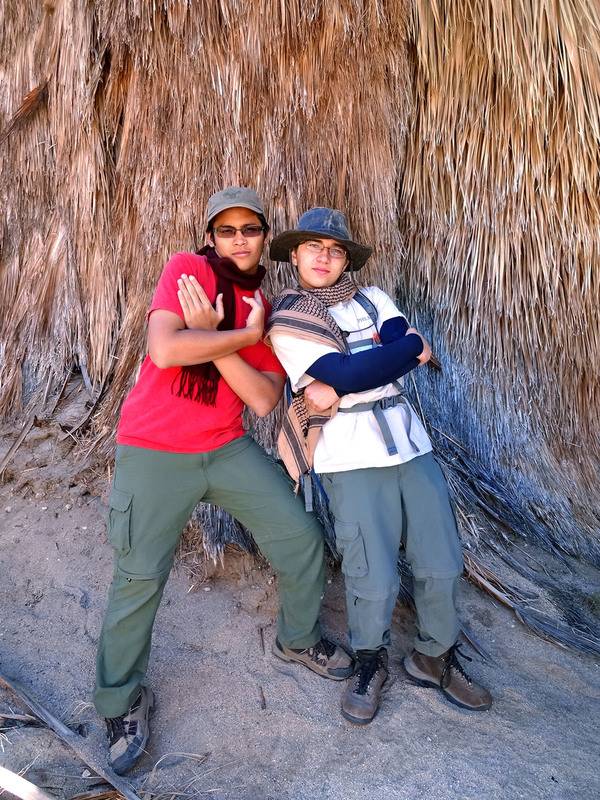 Two of our recent Eagle scouts. We will miss them when they head off to college next year! 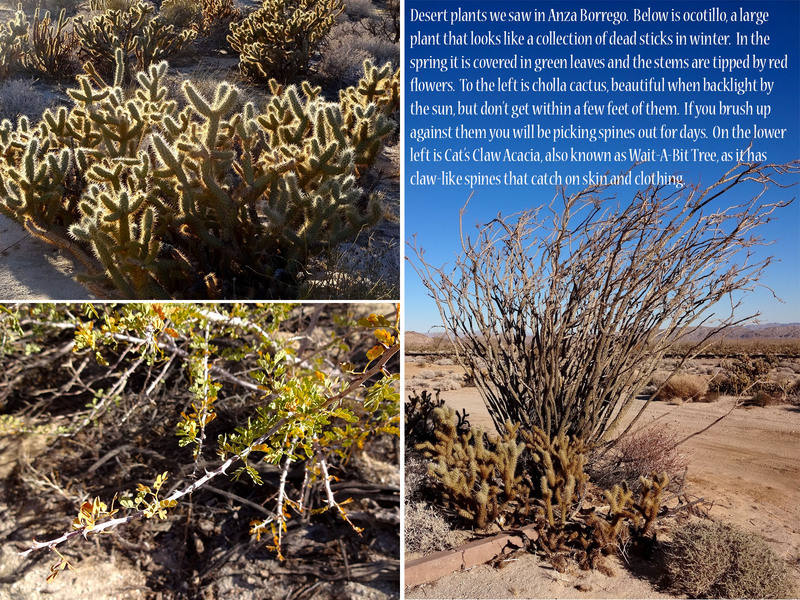 Desert plants. The bushes on the top were like a fairy tale spooky forest, though on a much smaller scale. Bonsai shrub and wildflowers. 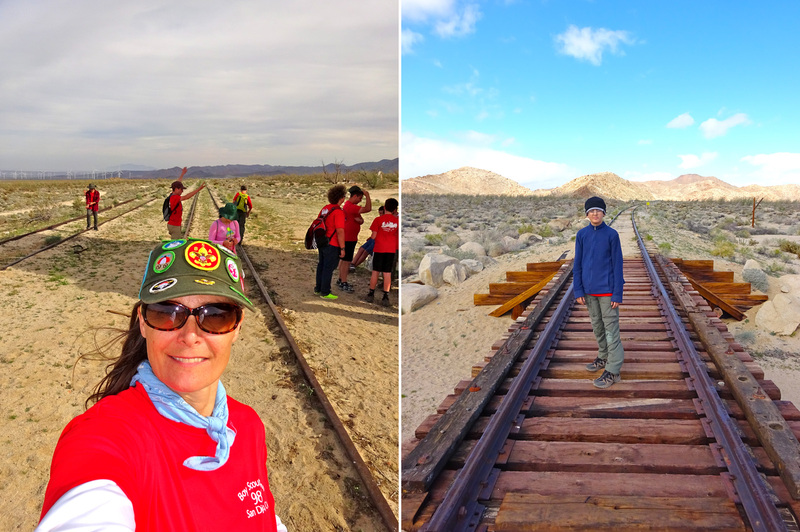 We left the palms and headed to the abandoned railroad station. This water tower is always a great sight, though I was sad that the sky was not blue this year. The rusty brown against a sunny sky is very striking. Mikey is either rescuing Irvan or attempting to tie him to the railroad tracks. Andrew is neutral, like Switzerland. 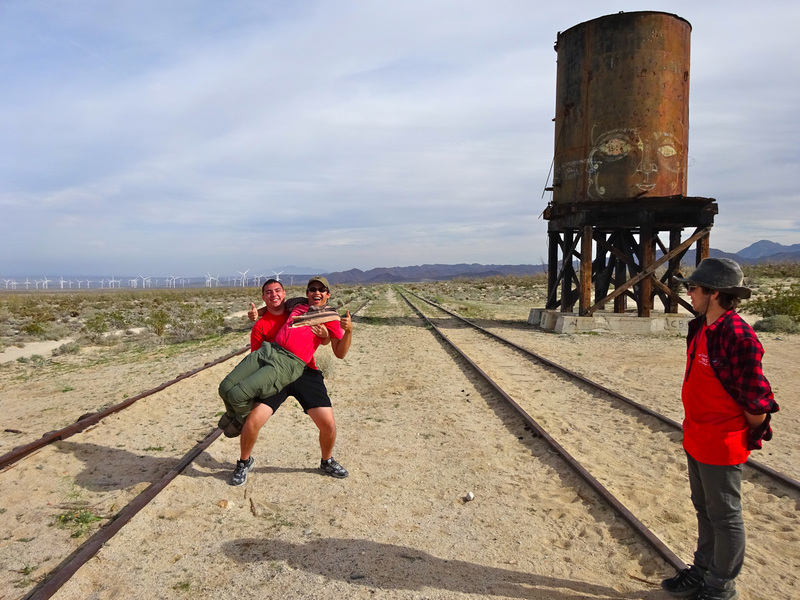 Sam and JD having a race along the tracks. I was tempted to push them over, but opted for taking their picture instead. Mr. S. in the “Instant Scoutmaster Machine.” Unfortunately, no one had a quarter to activate him. 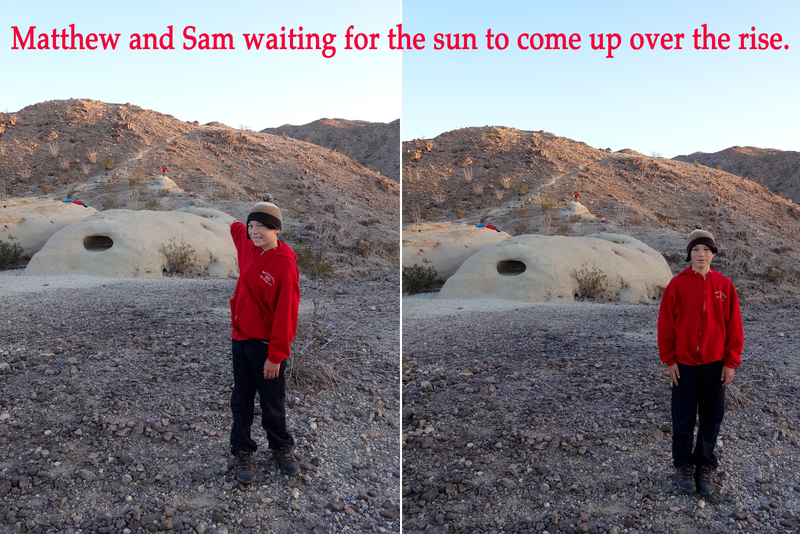 Sam, Matthew, and desert graffiti. 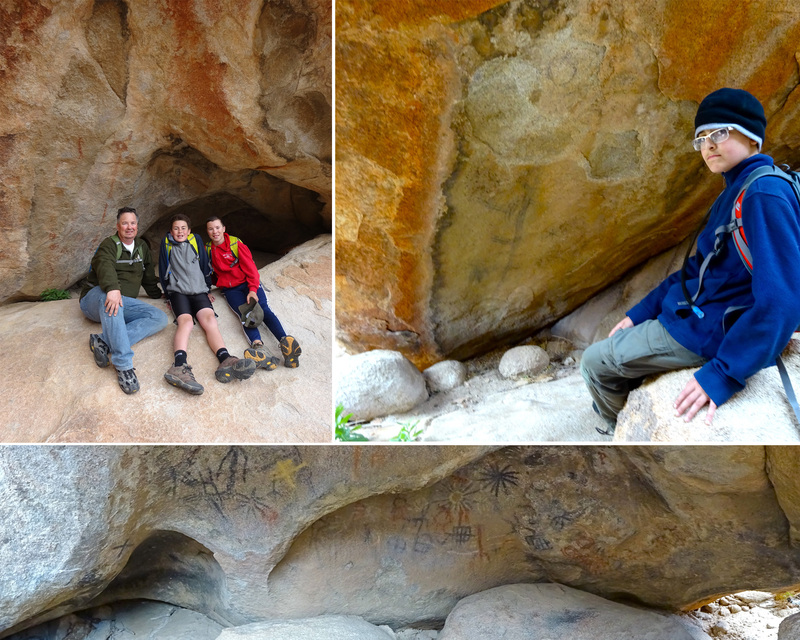 Next up, a hike to see a set of petroglyphs believed to be the first depiction by native people of a man on horseback. Though it looks pretty level, it is actually a pretty consistent uphill slog. In deep soft sand. With a brisk headwind. Did I mention there was wind? 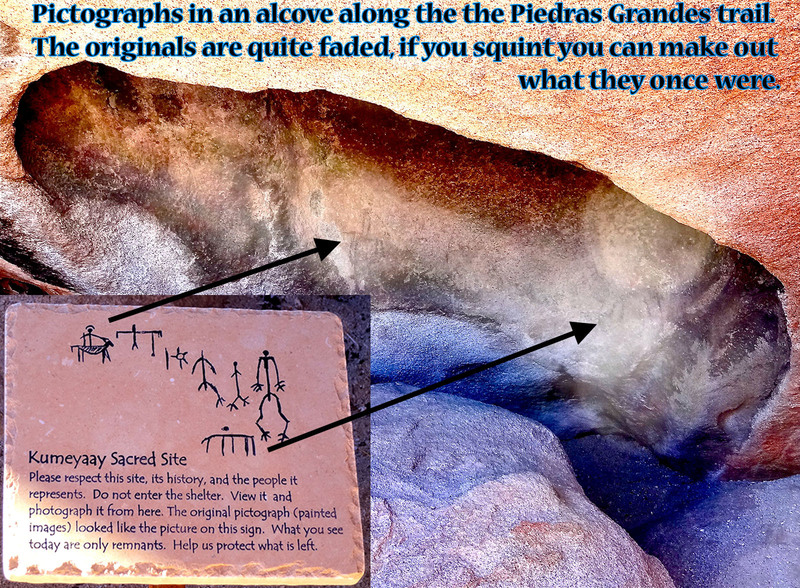 The petroglyphs are pretty faded, though there is a sign showing what you are supposed to be seeing. Stevie is complaining that I keep taking his picture. Don’t sit on a rock like the cutest little Buddha in the world, and then I won’t Stevie! It’s as simple as that. The conditions were challenging, but the scenery was easy on the eyes. At the trail head, waiting to head back to camp. 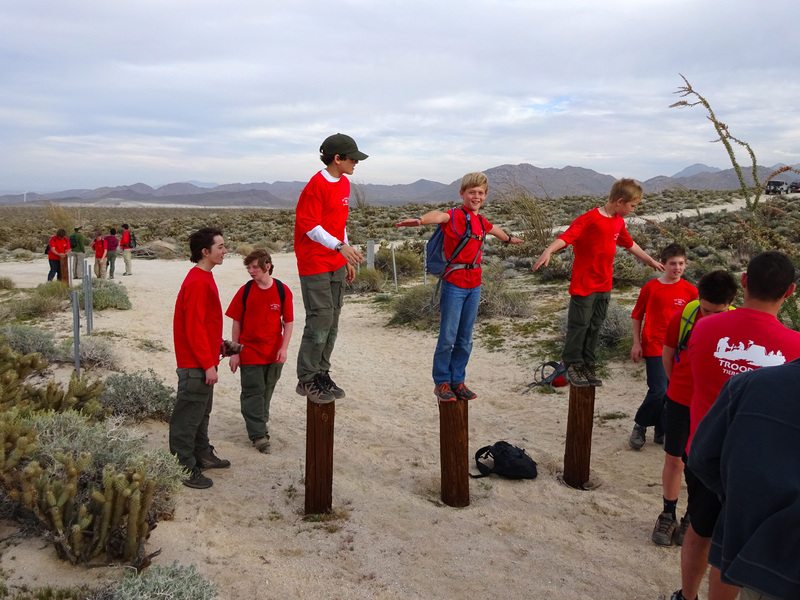 The boys are playing a game to see how long they can balance on the poles before a wind gust knocks them off. Morning at camp. After I crawled out of the car, I saw lots of dark clouds. We busted our butts to get the tents down and get breakfast started. It never rained, but the clouds did liven up the sky! The “Old Guard” of our troop. These guys have been mainstays for years, and we hope they continue to come out with us. We need Mr. H. to tell us where to turn! 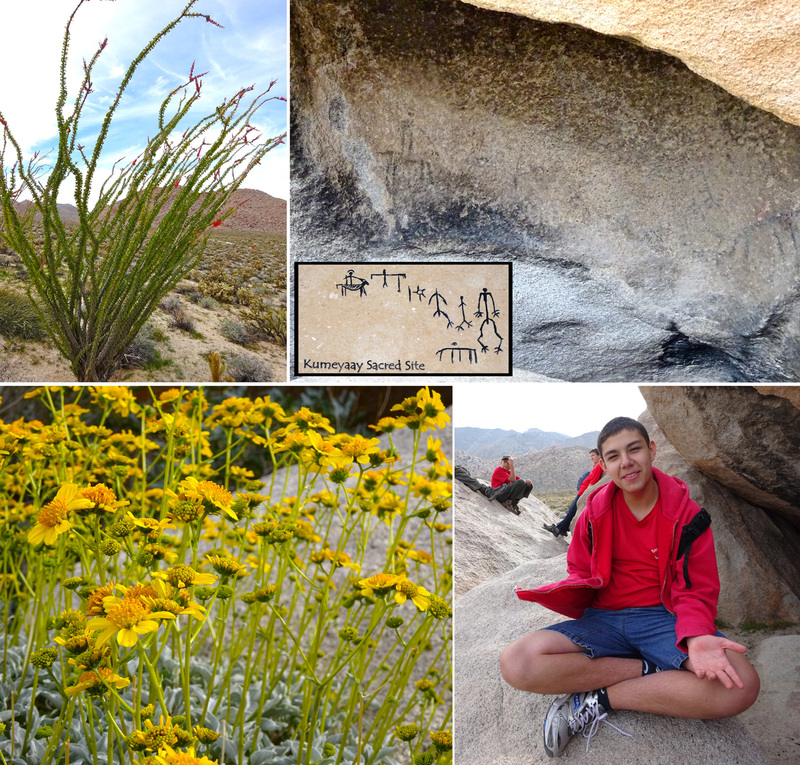 The last stop on our desert trip was to see another set of petroglyphs. These were spectacular. They were painted on a cave in a large grouping of rocks and boulders that rose up from the desert floor. Native tribes obviously spent a lot of time in the area, it must have been a comfy winter home. A long view out from the rock pile. 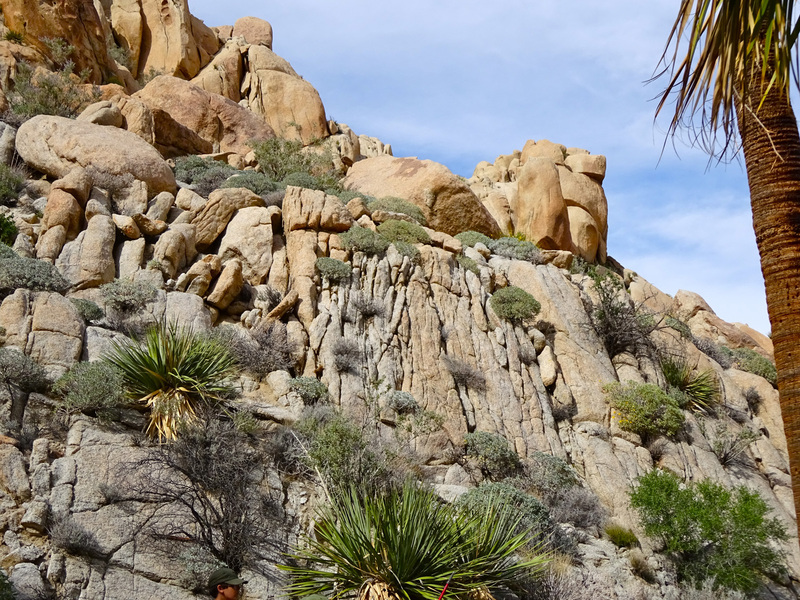 A short view of multicolored boulders. On our way in and out we crossed the rail road tracks again. 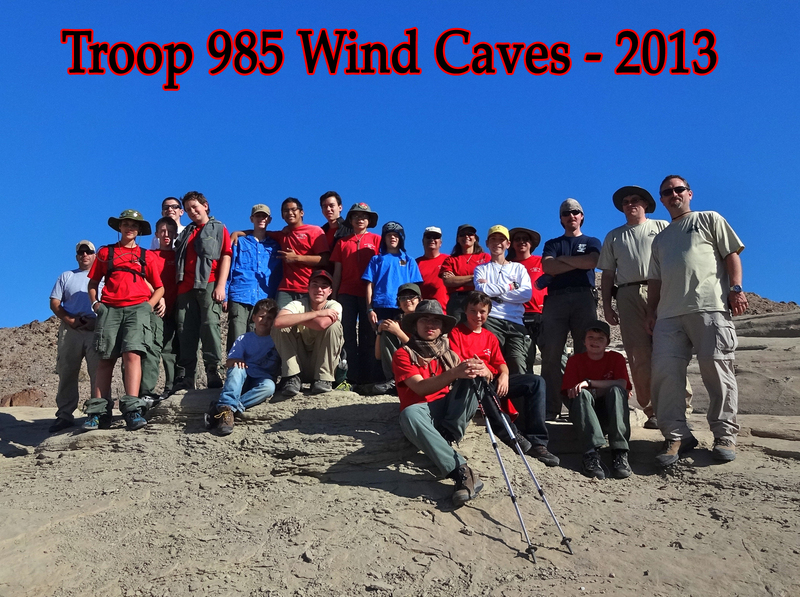 Our scouts at the end of another great trip. Mother, daughter (if you squint you can see her behind me in the pink), and son. This is how my mind works. 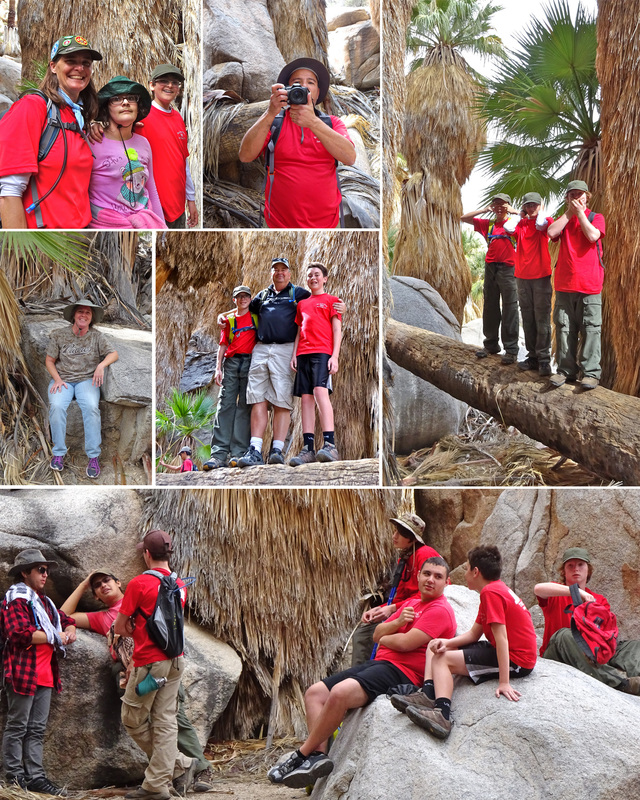 I went on another great outing to the Anza Borrego Desert east of San Diego with Sam’s Boy Scout troop, and took another excellent batch of photos during our weekend campout. One in particular caught my eye, a pic of Andrew, Irvan, and Ted getting dramatic with a flashlight inside a cave. 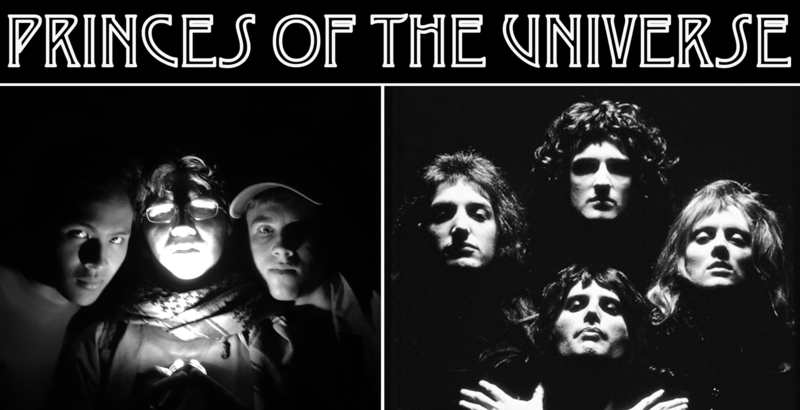 Immediately I thought of the classic album cover from Queen II, and that was it, the kernel around which I would build this post. I went to Wikipedia, that online well of information, to find a list of songs by Queen. I have paired photos from our trip with song titles, some of which will be familiar, others more obscure. Here is quick trip summary. 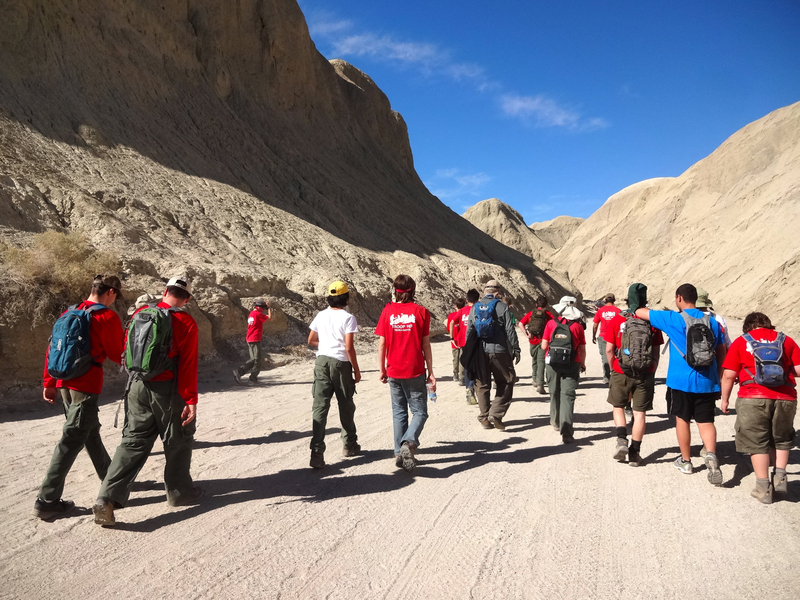 One of our intrepid scout leaders, Mr. R., led us out to Anza Borrego Desert State Park to explore the Arroyo Tapiado Mud Caves, one of the largest collection of mud caves in the world. 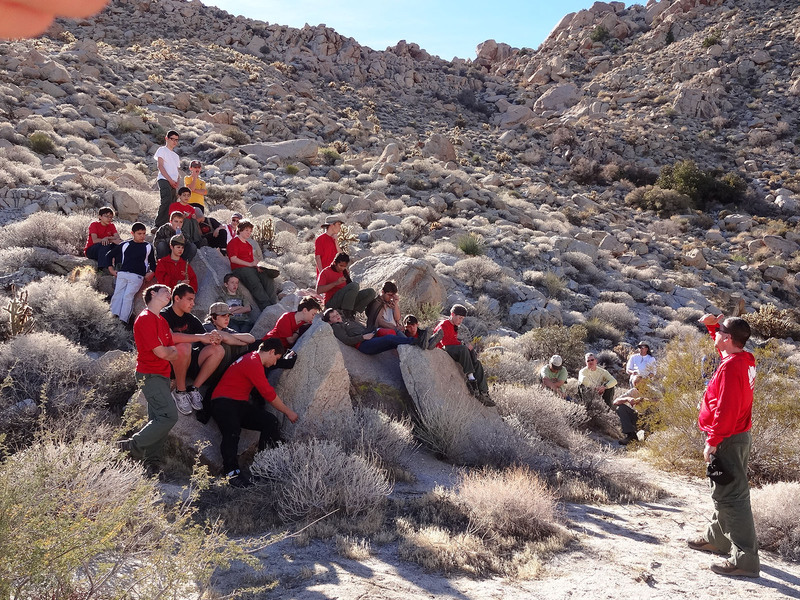 We had a nice sized group of 18 Scouts and 8 adults, and we all enjoyed fantastic desert scenery along with the perfect weather. It was warm with no wind and many Scouts slept out under the stars. 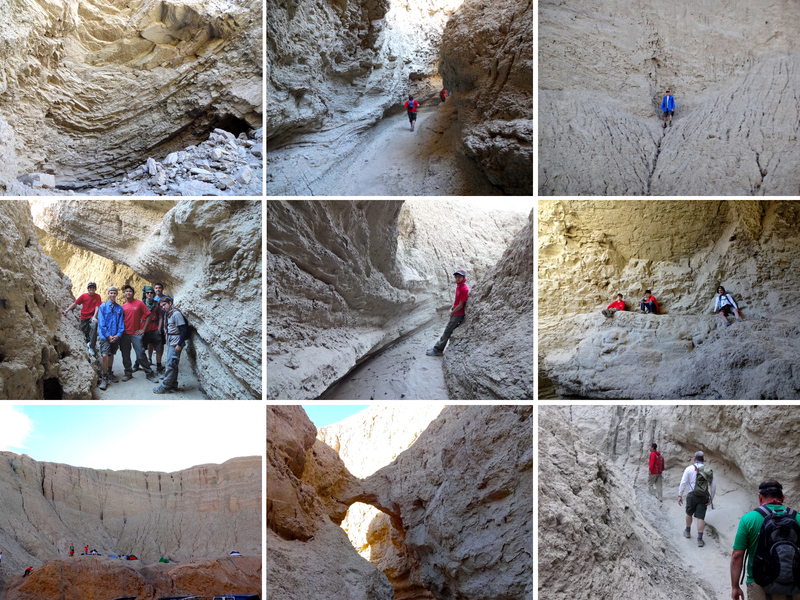 On Saturday and Sunday we explored many mud caves and slot canyons in the area (Big Mud Cave, Plunge Pool Cave, Hidden Cave, Chasm Cave, E-Ticket Cave, and Canyon Sin Nombre). Now, for a catalog of trip photos, each paired with a title from a Queen song. Double click on any of them for a closer look. 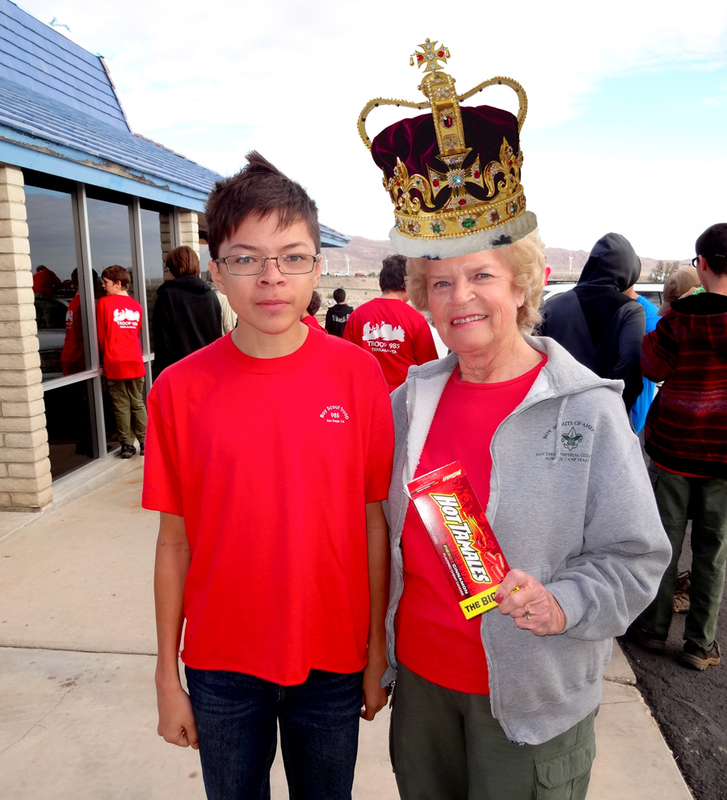 Starting us out is the grande dame of our troop, Ms. M., who participated in Scouting with her sons, and is now back for more action with her grandson Vincent. Don’t let the crown fool you, she left me in the dust (literally), when we started driving on the unpaved desert “roads”. A panoramic photo of our campsite. 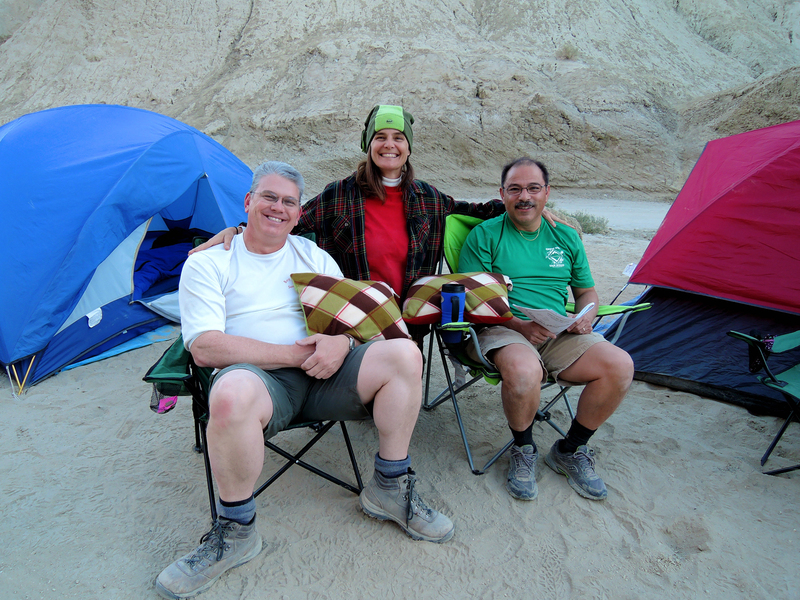 Some of us camped in the valley, and a group of scouts slept part way up the hillside on an outcropping. 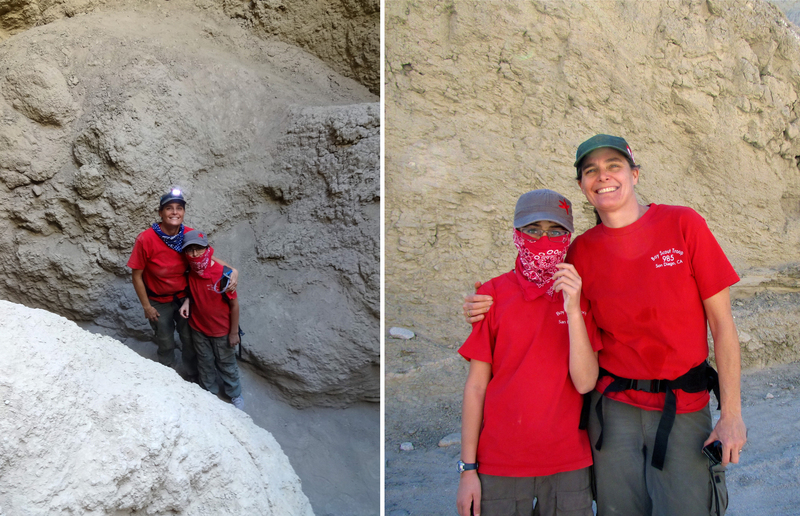 After we set up camp and ate lunch, we headed out to explore some slot canyons and mud caves. First up, Big Mud Cave and Plunge Pool Cave. 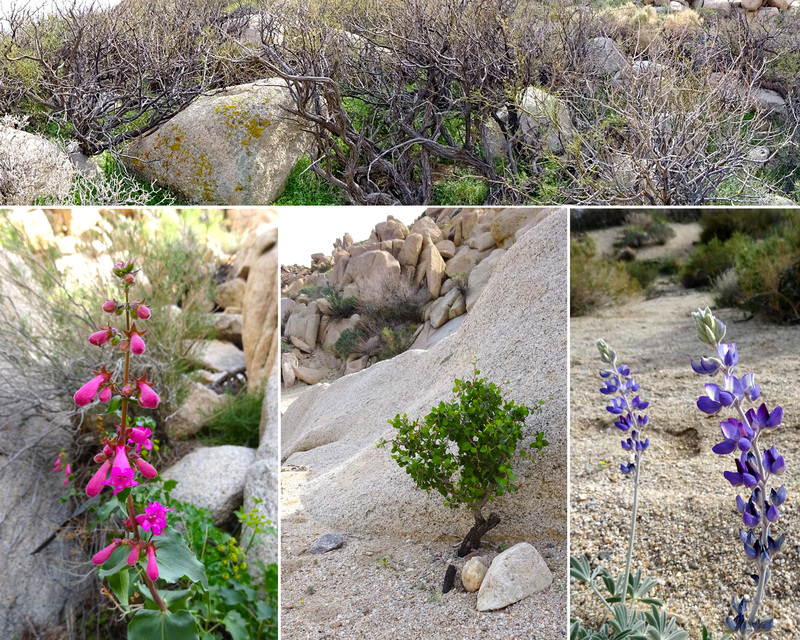 Some of the photos below are from the hillside above our camp, some from the slot canyons we hiked in. The geology was fascinating. 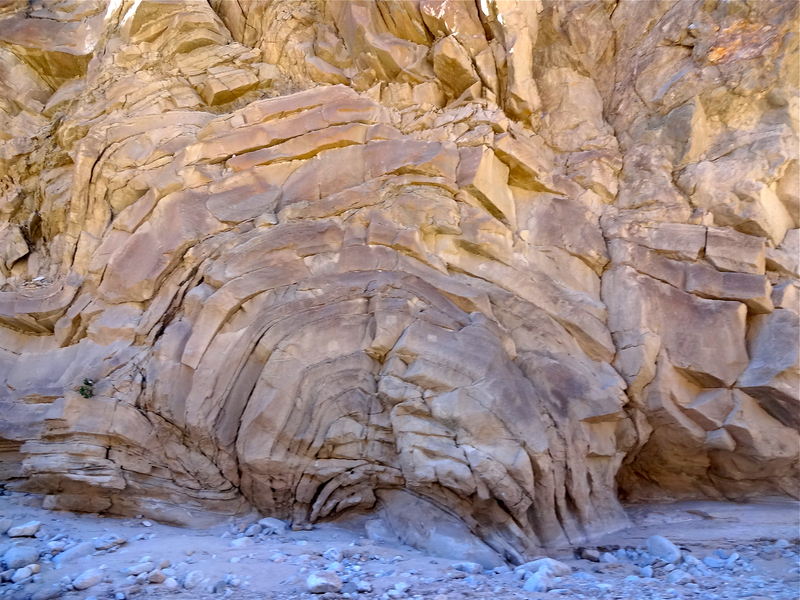 Swirling sedimentary rocks full of twisted layers and embedded stones. The title of this one says it all. That’s my boy. 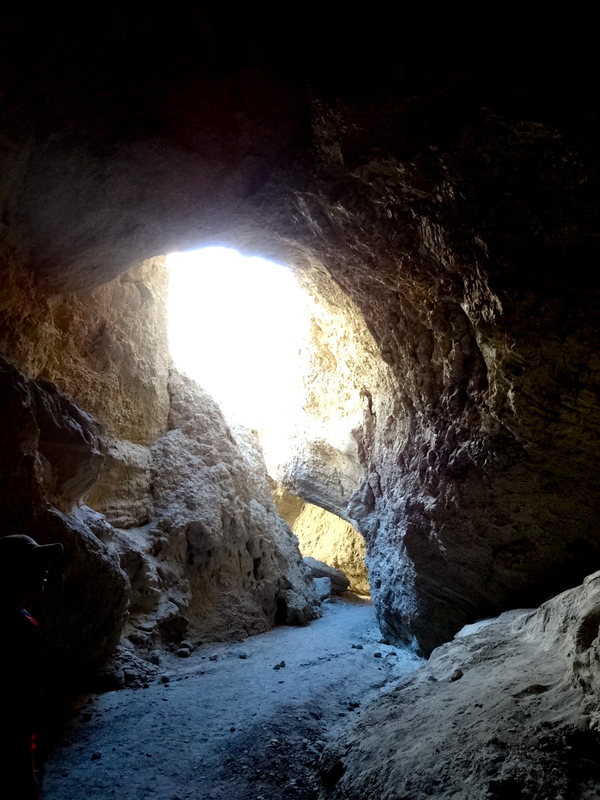 Many of the caves and canyons had skylights. The mud caves were formed by water pooling on top of the cliffs and then seeping down into the sedimentary rock, gradually eroding tunnels, canyons, and caves. I know the title of that last one is a bit of San Diego weather snarkiness, but I couldn’t help myself. 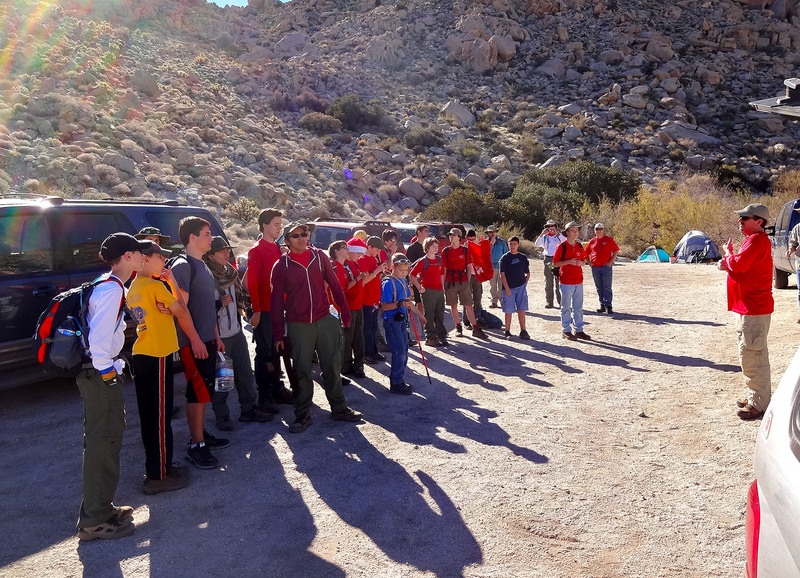 Below is a photo of the scouts heading back down into the canyon. Next up, Hidden Cave. So the next cave we went into was in the cliff side just behind our camp. We wore bandanas because it can get pretty dusty. We had a conga line of 23 people who made our way into the cave, our destination was a small room a bit of ways in. It started out okay, not tons of room, but there was mostly a good foot or two on either side, and another several feet above our heads. It didn’t stay that roomy. After about 10 minutes of snaking our way in, I admit that I was starting to feel claustrophobic. But there wasn’t much to do but keep going. I can say now I went into a cave like that, and it’s not really something I need to do again. Sam and I positioned ourselves near the mouth of the tunnel leading out, and were #2 and #3 outta there, just behind Mr. R. Some of the photos below are from the next cave we went to (which was way bigger). In the photos you can see all the dust particles in the air, picked up by the flash. Here we all are in the room at the end of Hidden Cave. A single song title was not enough to cover this one. Don’t be fooled by how light it looks, it was all flash. 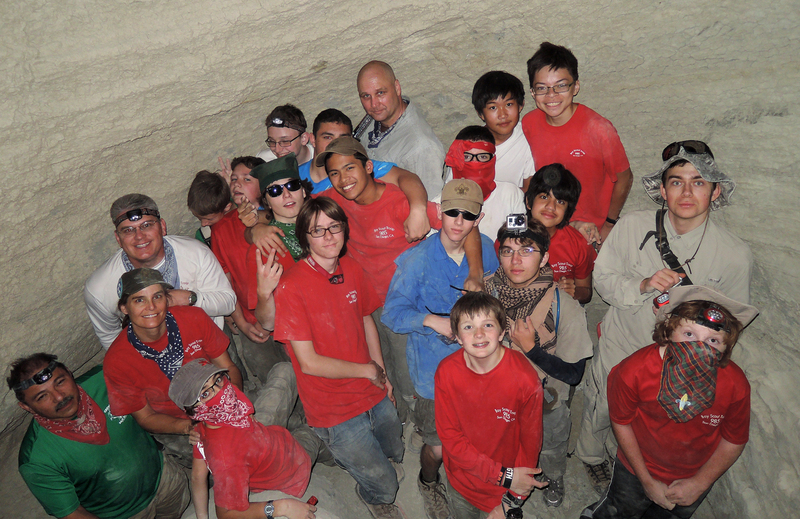 I think most everyone except the slimmest and smallest of the scouts were on their hands and knees at some point, trying to get through the most narrow portions of the cave. Mr. S. shows off his battle wounds. The next cave was Chasm Cave. 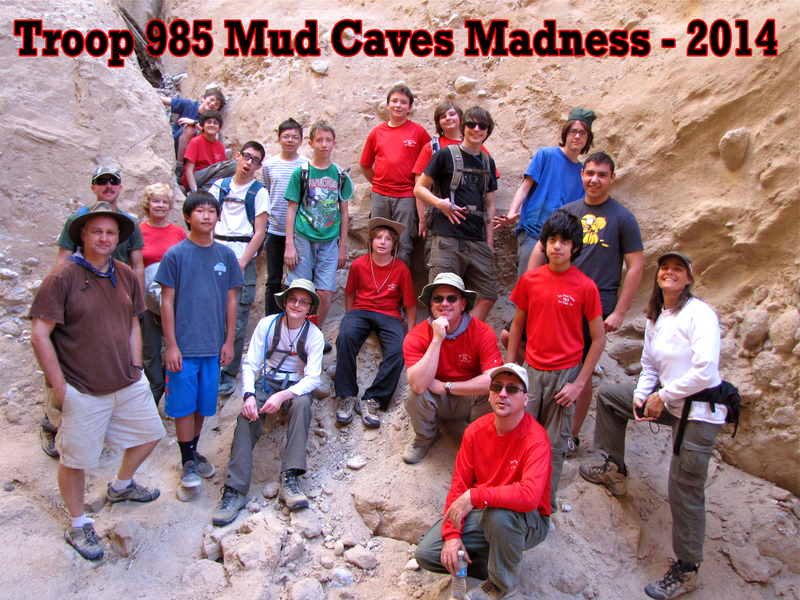 It was a combination of slot canyon and enclosed mud caves. 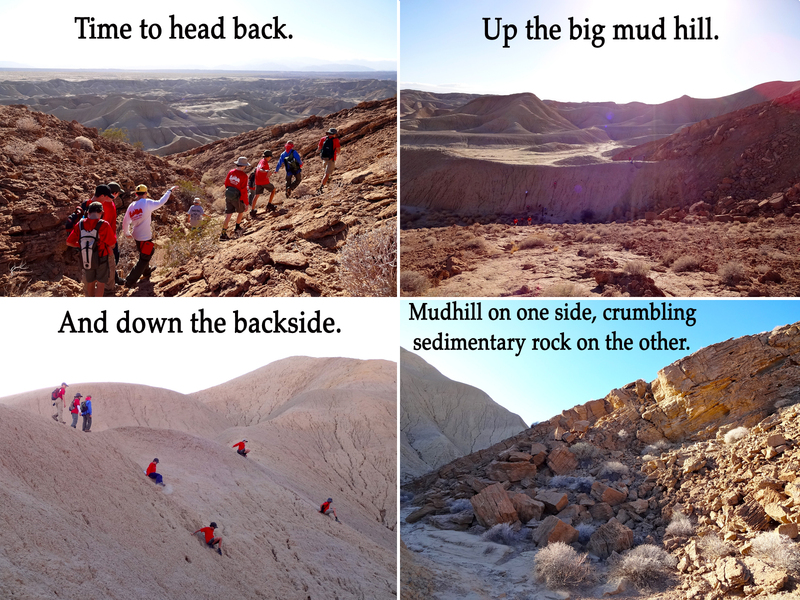 Again, amazing geology all around and fun rocks to scramble over. 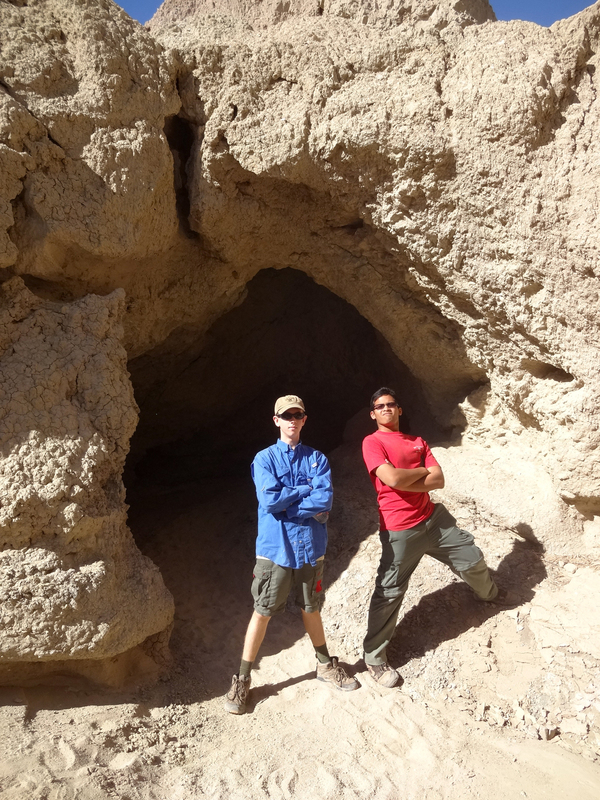 Here are Ted and Irvan, acting as Cave Bouncers. Mr. R. and Mikey, Mr. S. and Joseph, Mr. K. and Nolan. Justin and Mikey under a skylight. 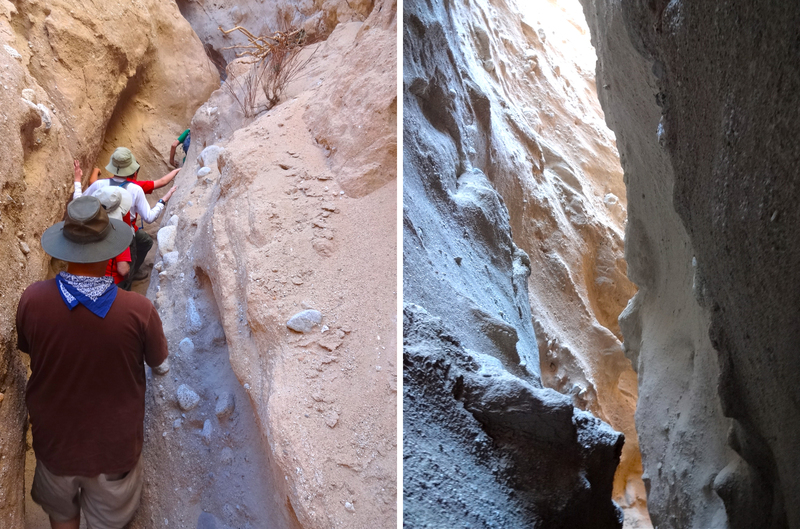 Transitioning from mud cave to slot canyon. Back to camp, time for a cup of tea/coffee for the parents, game playing and running around for the boys. Here I am relaxing with Mr. S. and Mr. R.
The boys had a different idea of fun, and broke out the Munchkin cards, which is becoming a bit of a tradition in the troop. 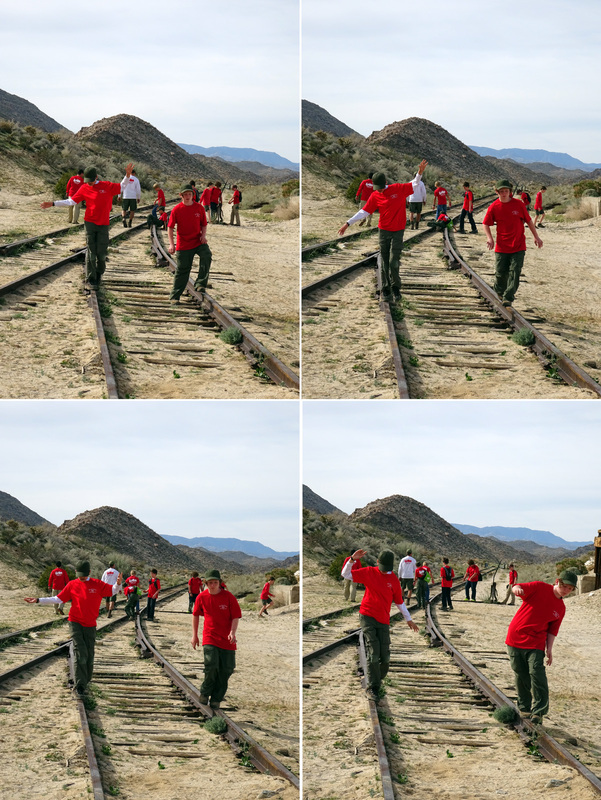 The boys aren’t allowed to bring electronics, and it was gratifying to see them interact with other human beings, without being hooked up to a computer or phone. Night fell, and it was a beautiful one. It stayed warm, there was no moon and the stars blanketed the sky. Mr. H. is an astronomy buff, and he got us all up together on the outcropping to watch a satellite go by, as we were in the right place and time to see an iridium flare. This is when sunlight flashes off of the solar panels on a satellite, and it becomes momentarily brighter than the brightest star. It only look the satellite a minute to fly by, and it flashed for about 3 seconds. It was really cool. 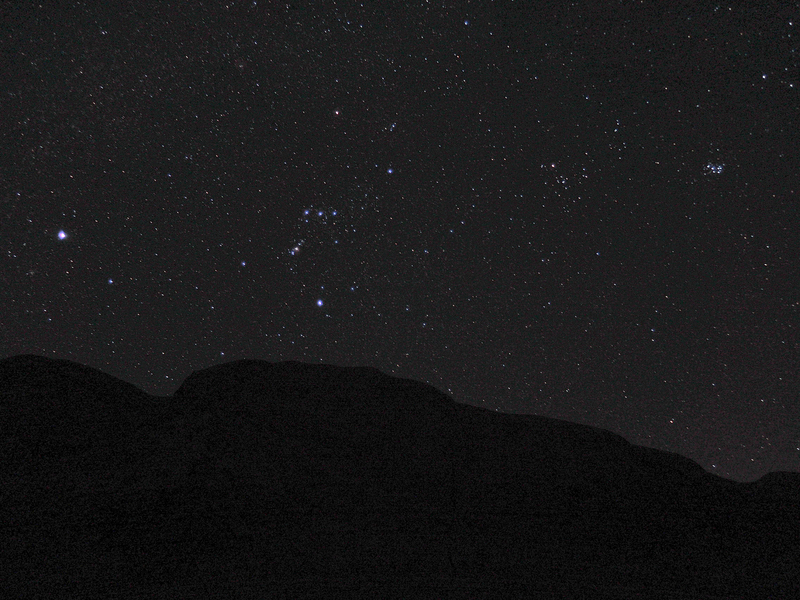 Below is the night sky, taken by Mr. H., showing Orion, Sirius the Dog Star, and the Pleiades perfectly. Scenes from around the campfires, and more Munchkin playing in Sam and J.D.’s tent. 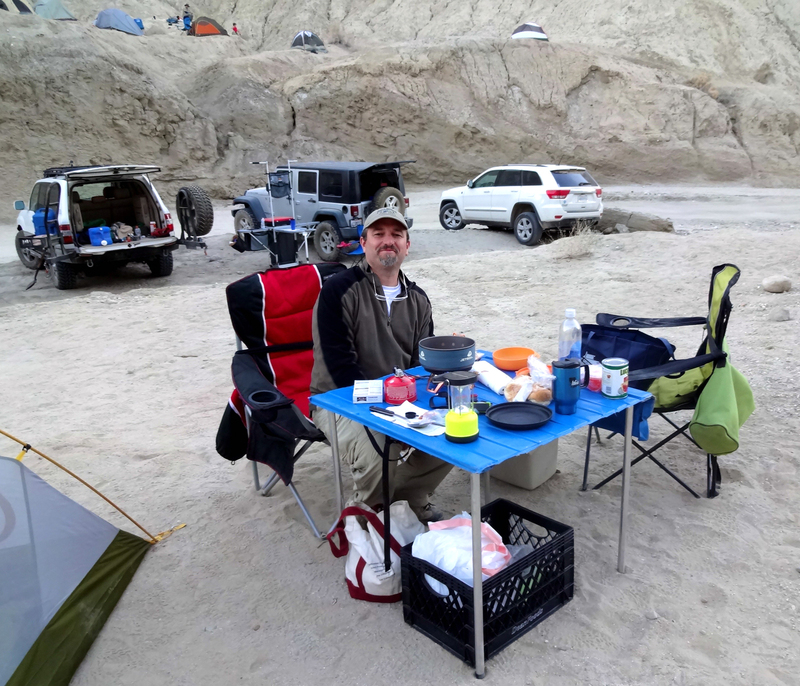 In the morning we breakfasted, cleaned up camp, and then headed out to Canyon Sin Nombre to explore a narrow slot canyon. 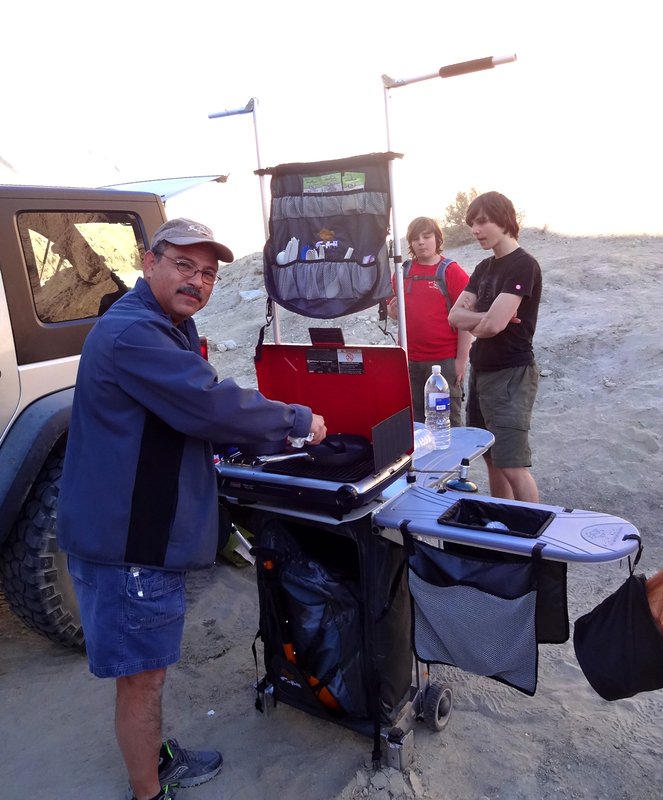 Here is Mr. R. with his cool camp kitchen. The canyon was well worth the side trip on the way out. Really impressive cliffs rose up on either side, and the canyon ranged from quite narrow corridors to large open rooms and bowls. 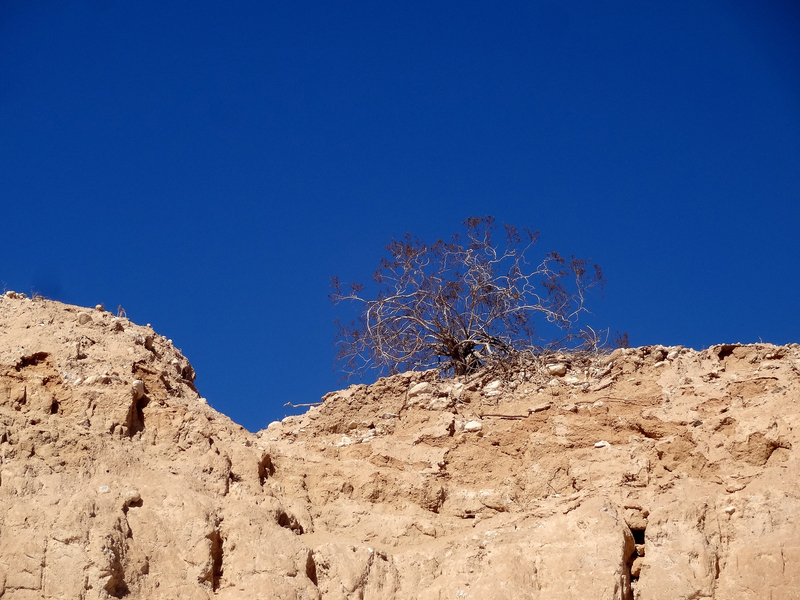 I really liked seeing desert plants clinging to the edges of the cliffs. It drove home how dogged some organisms are, to survive in this harsh environment. A group shot of the gang on our way back out. 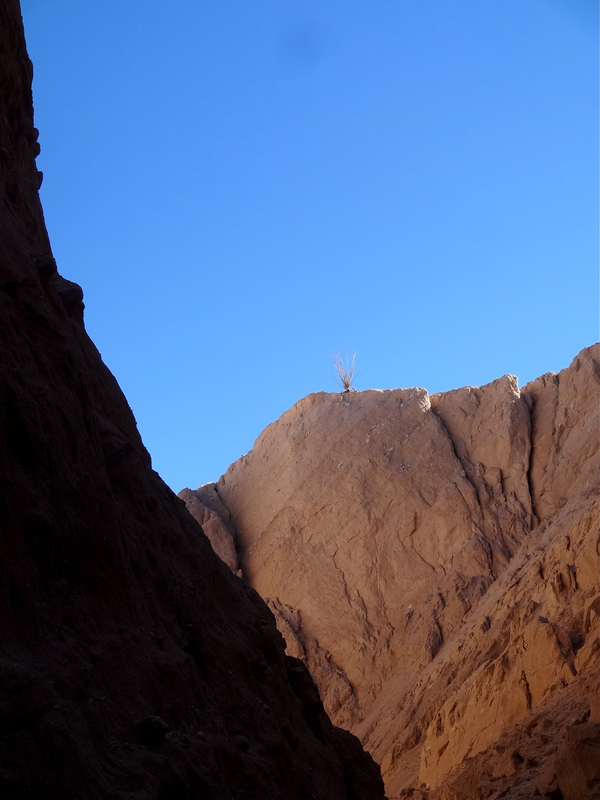 A wonderful view at the entrance to the canyon, with small trees in front and purple desert mountains behind. 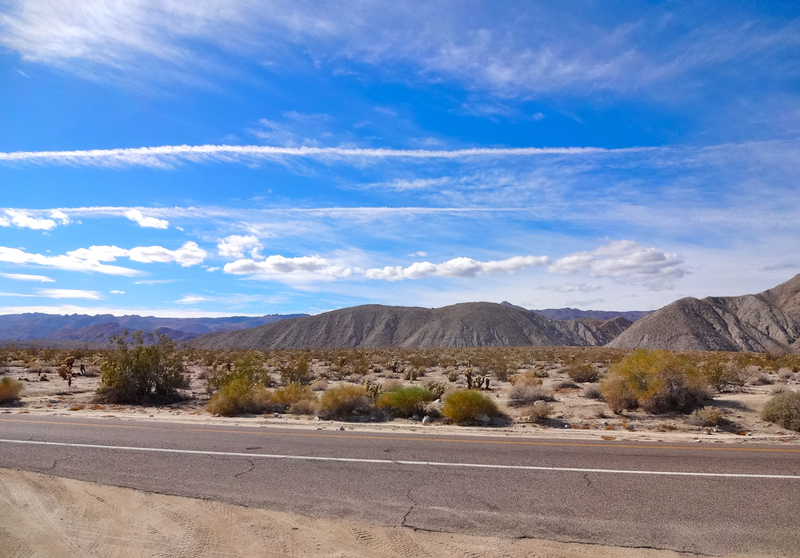 Some shots on a desert highway. This is the only street sign for miles and miles. Sam and his buddy J.D. A few hours later we were back home, with a dusty car, dirty socks, and lots of great stories to tell. Videos links below from Mr. H. and Andrew’s GoPro camera. The first is of the drive out (you can see me, Sam, and JD packing up my red Subie at the start), and the second shows video Andrew took as he made his way out of Hidden Cave, with the camera strapped to his head. Check out their Youtube channel (SkyhunterSD) for more videos! A rock formation that resembles a head, in three different lights. It loomed above our campsite on the crest of a ridge. 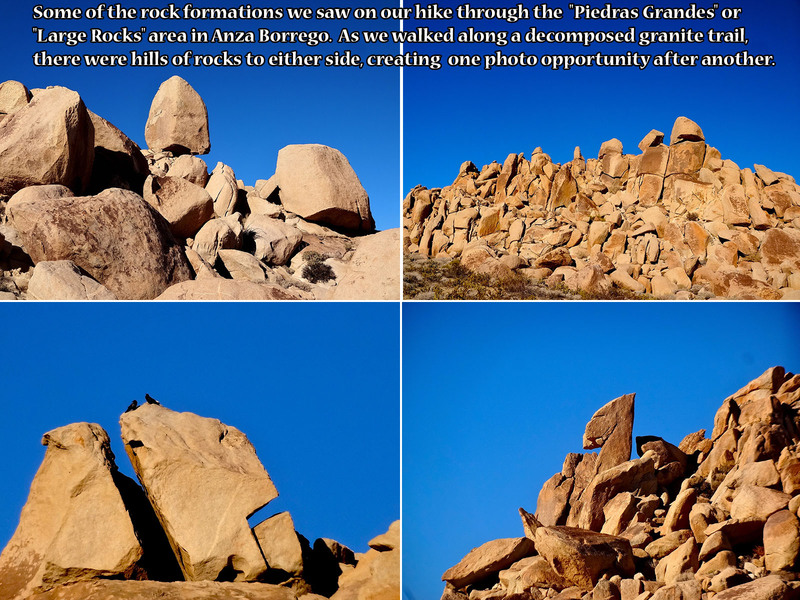 The area is called Dos Cabezas, or Two Heads, for rock formations resembling heads that perch on the hillside. 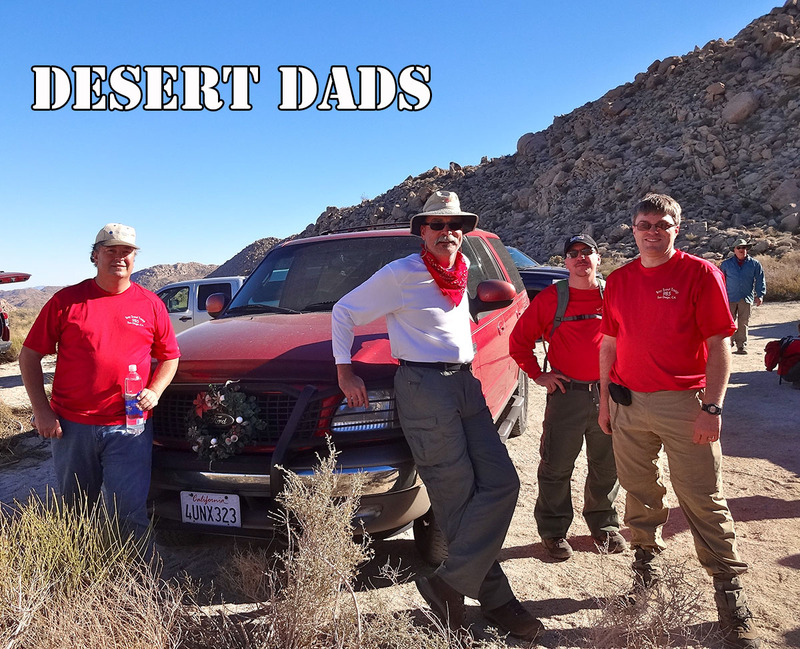 Gentle readers, it is time for another installment of…off-roading, four-wheeling, dust-covered, gear-mashing, rock-avoiding, wash board-loving vehicles, and the men who love them. 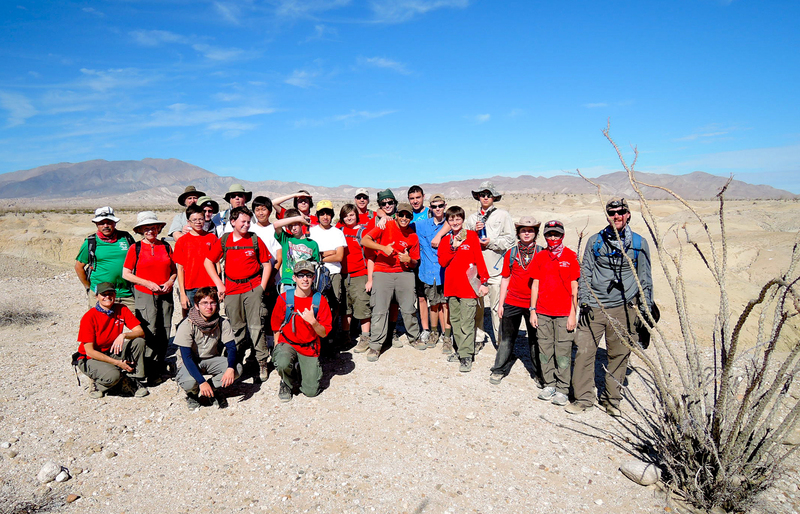 Oh yeah, and we did some desert camping with the Boy Scouts again. 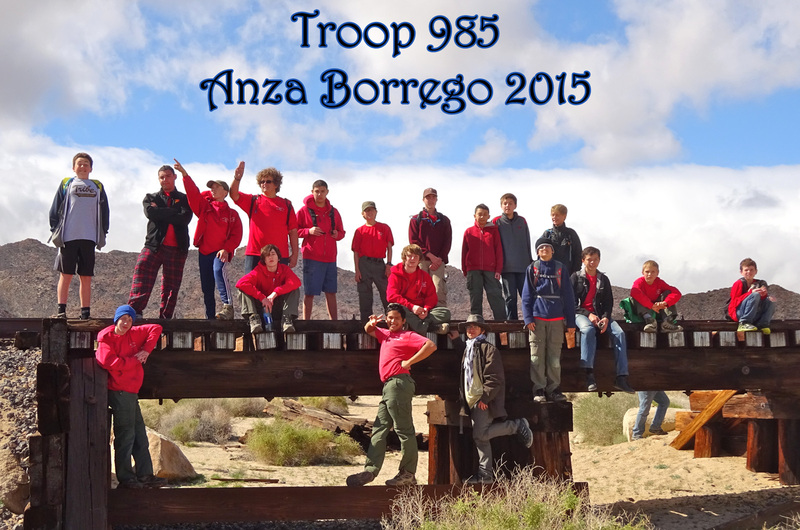 Once again I managed NOT to drive when Sam’s Boy Scout troop headed out to camp in the wilds of the Anza Borrego desert. I have a four wheel drive Outback, but the clearance is not great, which is the excuse I use for not driving. 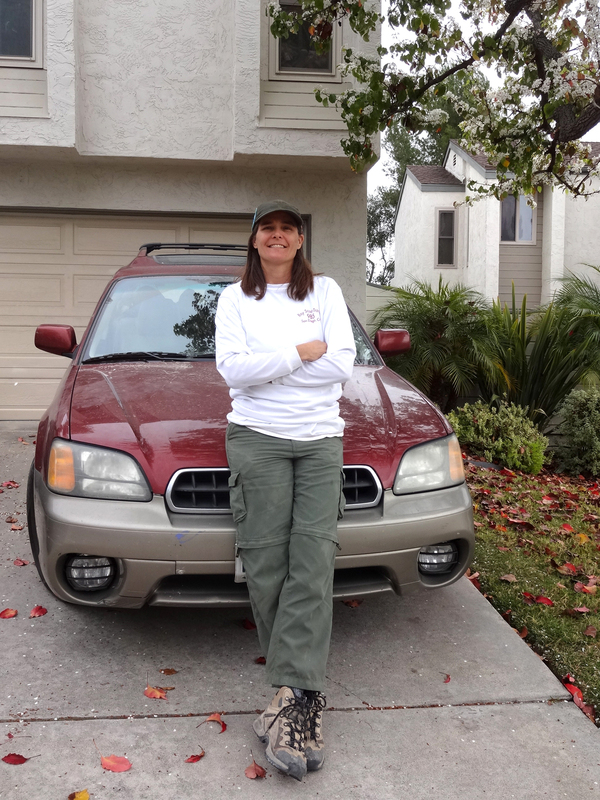 Unlike the dads in our troop, who love driving their trucks and SUVs up and down dirt roads, careening over boulders, and brushing into ocotillo and scrub, I prefer to sit comfortably in the passenger seat of Tony’s Ford Expedition and admire the landscape. Amazingly, we had PERFECT weather for this trip, from start (when we gathered in the Von’s parking lot at 6:00 AM (except for Mr. R. who overslept, thus catching up on his beauty sleep)) to finish, (when we cruised back to San Diego on the 8, passing giant windmills, the Golden Acorn Casino, and the many cameras at the Border Patrol checkpoint (say cheese!)). The troop hopped on a highway heading east from San Diego, and when we reached the middle of nowhere, we turned off on to a dirt road. 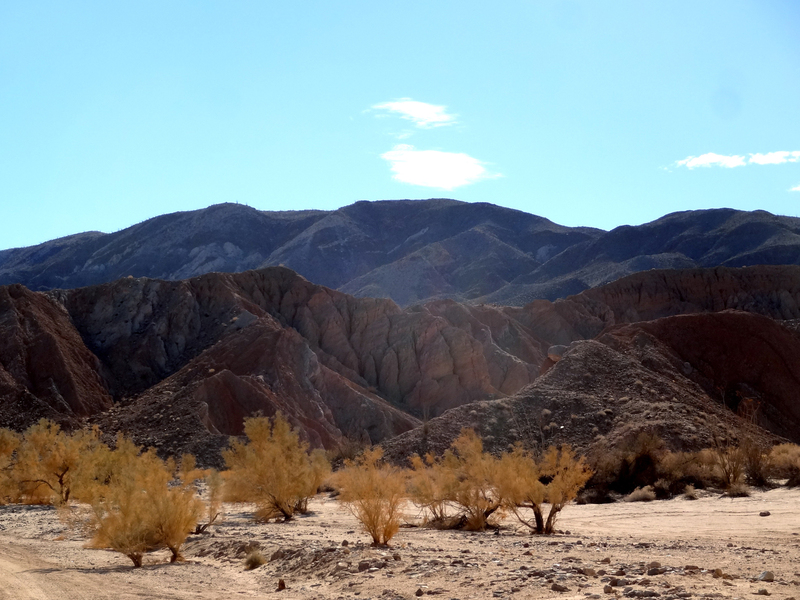 The landscape was bare and beautiful, full of amazing geology and desert plant life. 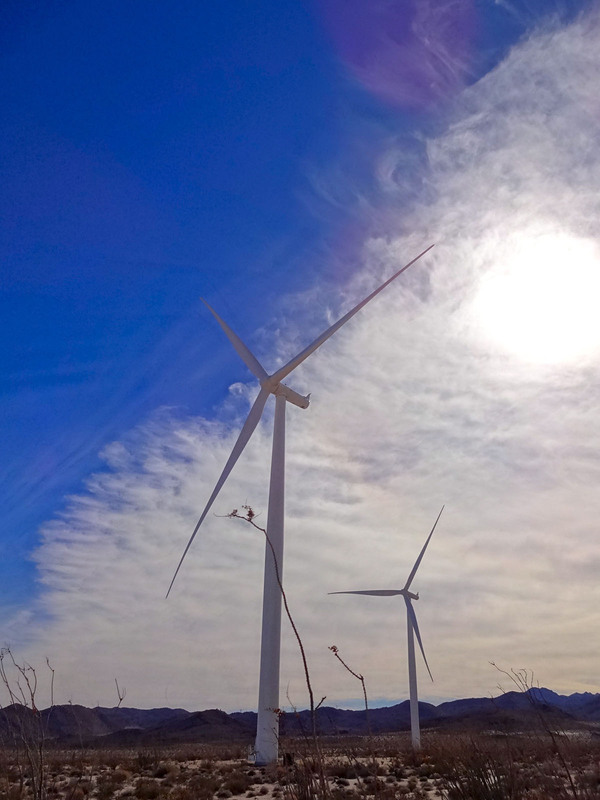 In the past few years the desert has also become home to many giant windmills, which are beautiful and impressive in a way, but also quite an intrusion on the wilderness. 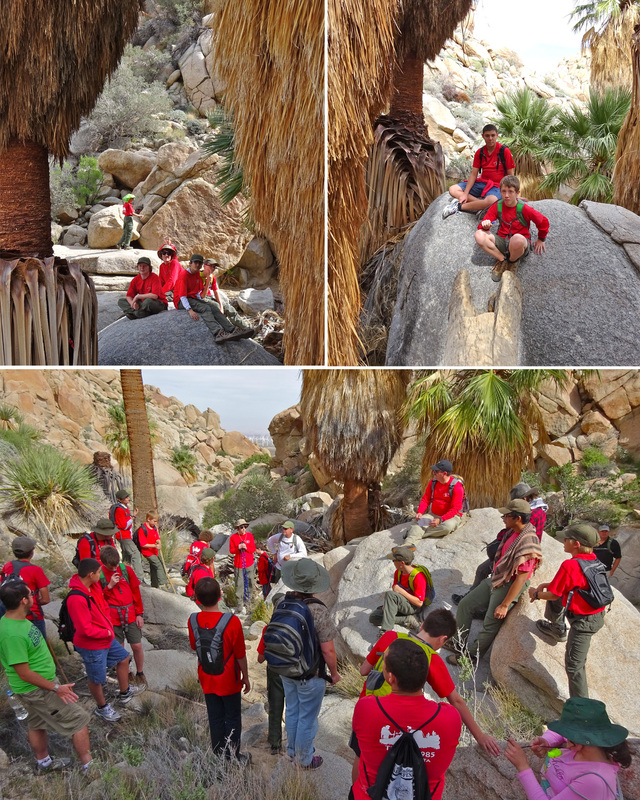 After we arrived in the area where we were planning to camp, we settled on our sites, pitched the tents, ate some lunch, and then Mr. H. gathered the scouts together to head out on a few day hikes. Our first destination was a Montero palm oasis, filled with at least 50 huge palm trees. 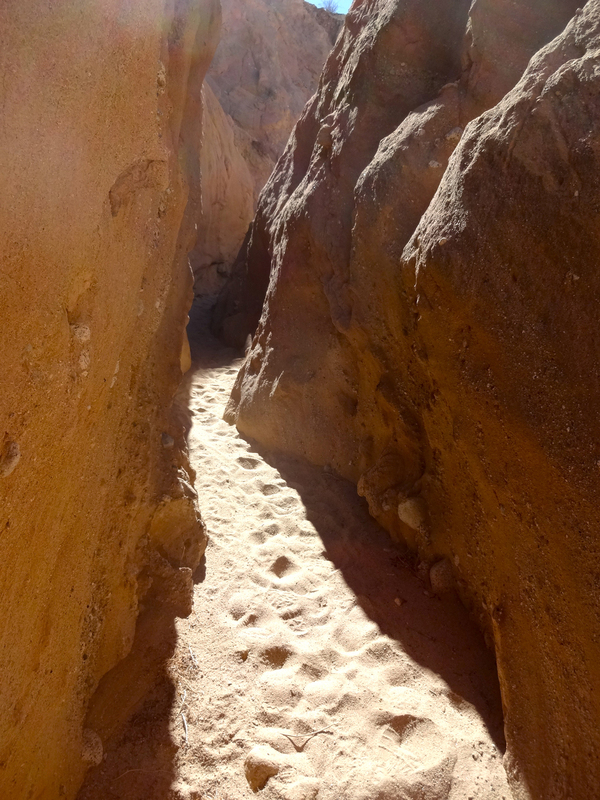 We hiked up a canyon, to the oasis surrounded by boulder-strewn hillsides. The palms have never been trimmed, and their skirts of old leaves stretch from their crown to the ground. The scouts all immediately scattered, to scramble up the hillsides, or investigate the nooks and crannies of the palm grove. Off we go to the palm oasis. 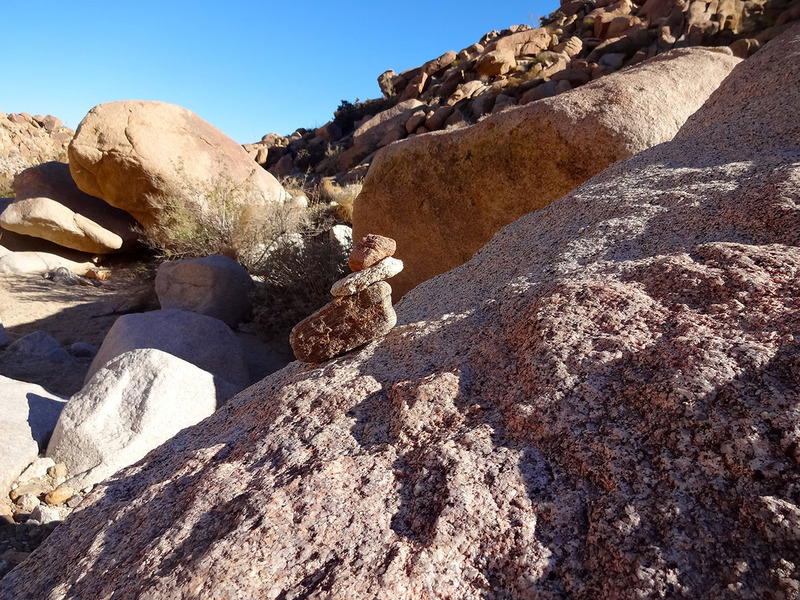 Rock cairn marking the trail. Big palm trees. Can you find the scout leaders? 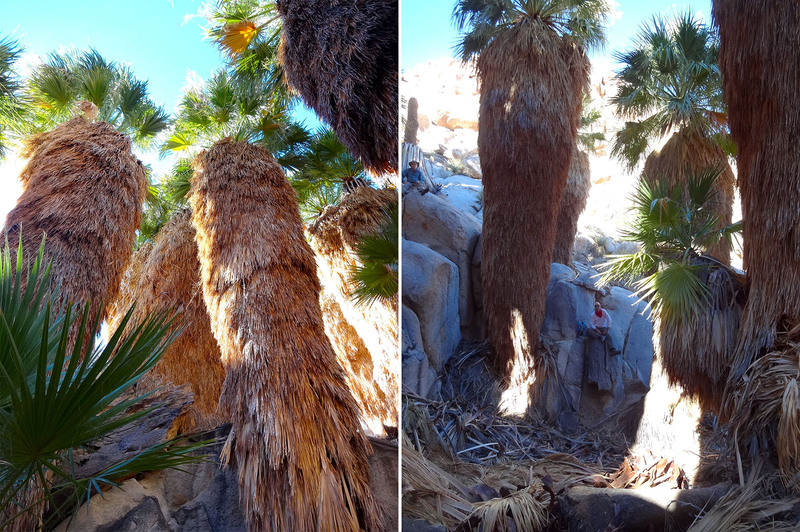 More scouts in the palms. J.D.’s hair color almost exactly matches the palm skirt. Lots of rocks to crawl over and under. A big rock on the hillside above us that looked just like a foot. The view down to the valley, with windmills in the distance. We spent an hour or so in the grove, and then hiked back down to our cars at the trail head. 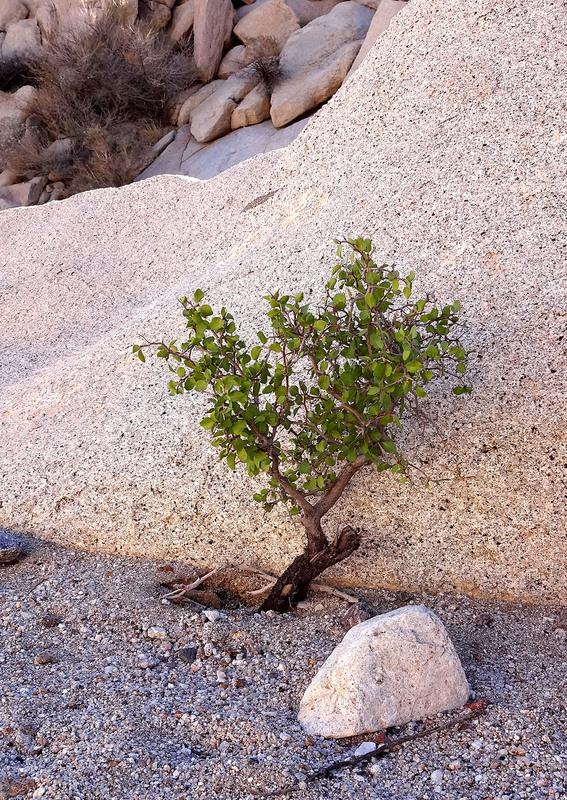 I saw this perfect little desert bonsai tree on the way down. 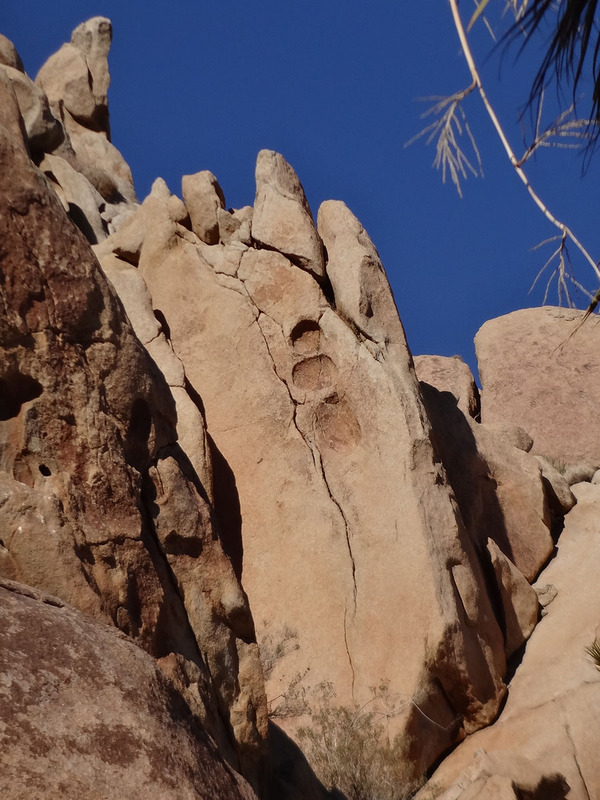 We also saw morteres, or grinding holes, on the hike down. 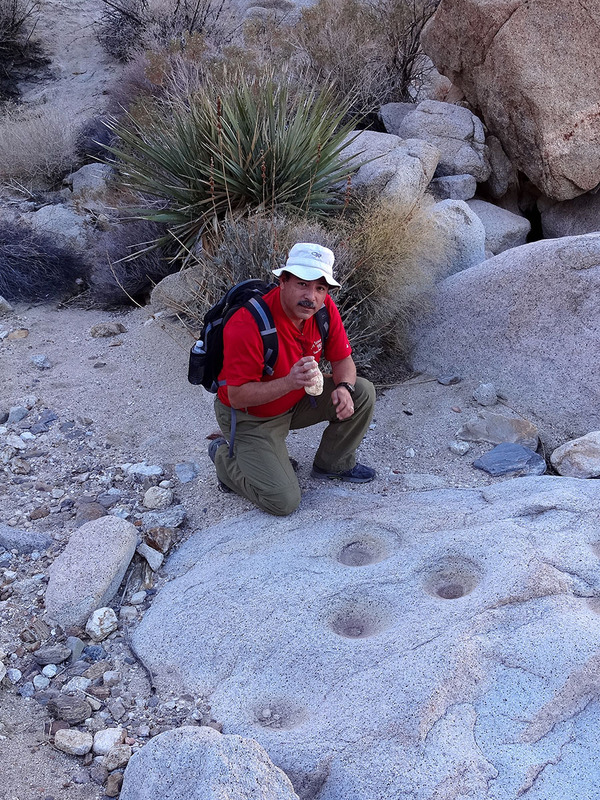 Kumeyaay Indians used to mash acorns in these holes when they stayed in seasonal villages in the area. Mr. R. demonstrates the technique. Doesn’t he look well rested? 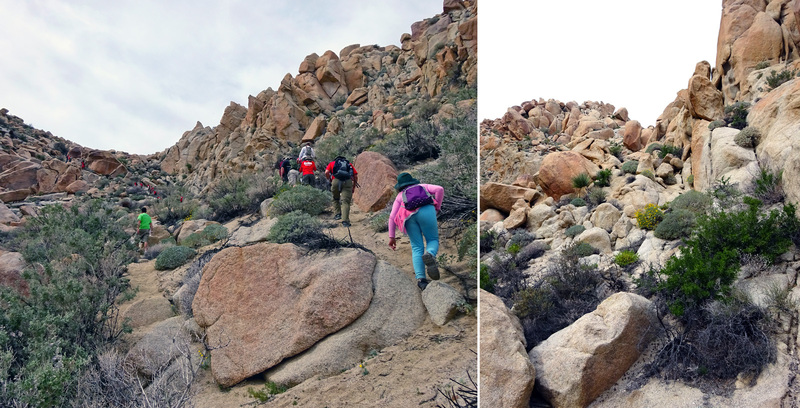 We rested for a bit, refilled our water from containers in the car, and then drove a sort distance to our second hike in the Piedras Grandes (Big Rocks) area, just a mile or so away. Older scouts look cool when they rest, younger scouts ham it up. The dads with Mr. M’s big red Ford, festooned with a wreath for the holidays. 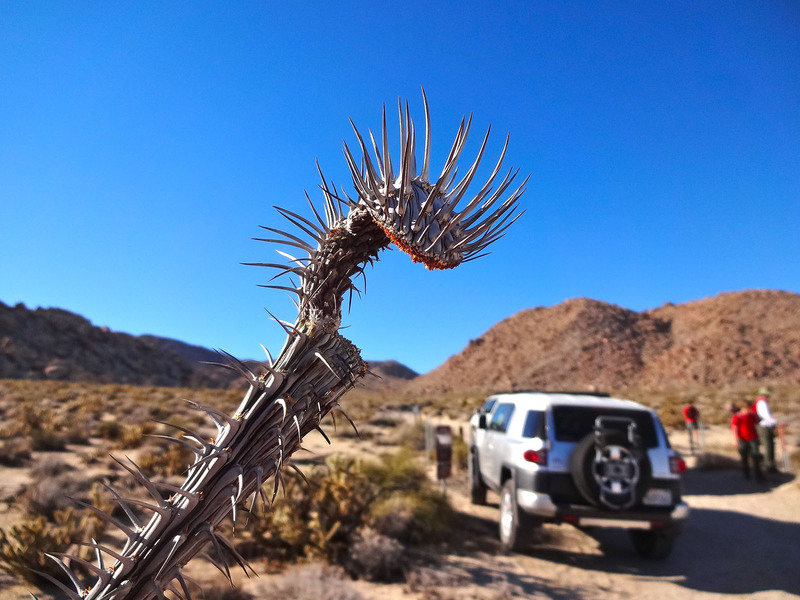 At the trail head to Piedras Grandes, there was this weird ocotillo branch, that looked like an alien head. 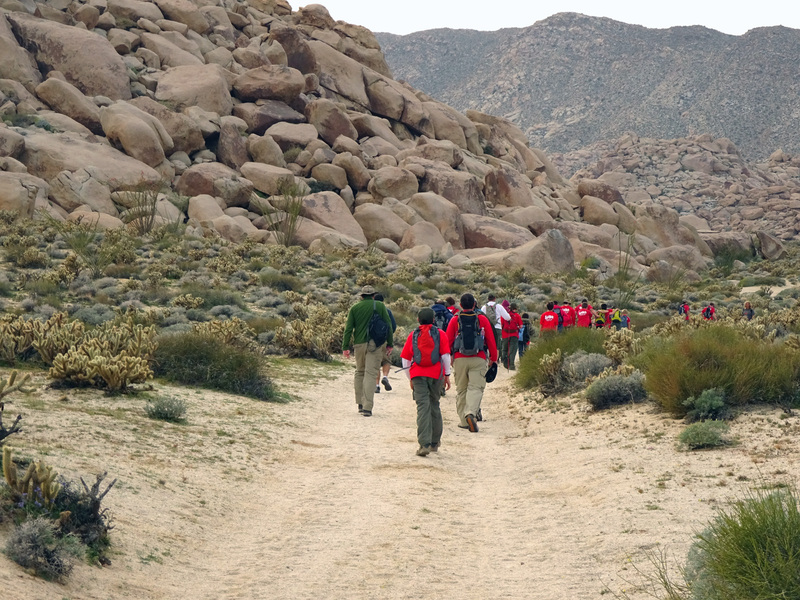 The hike was along a crushed rock trail, which was almost like hiking in beach sand. It was a gradual but constant uphill trek, and took a bit out of all of us, as we walked along in the afternoon sun. 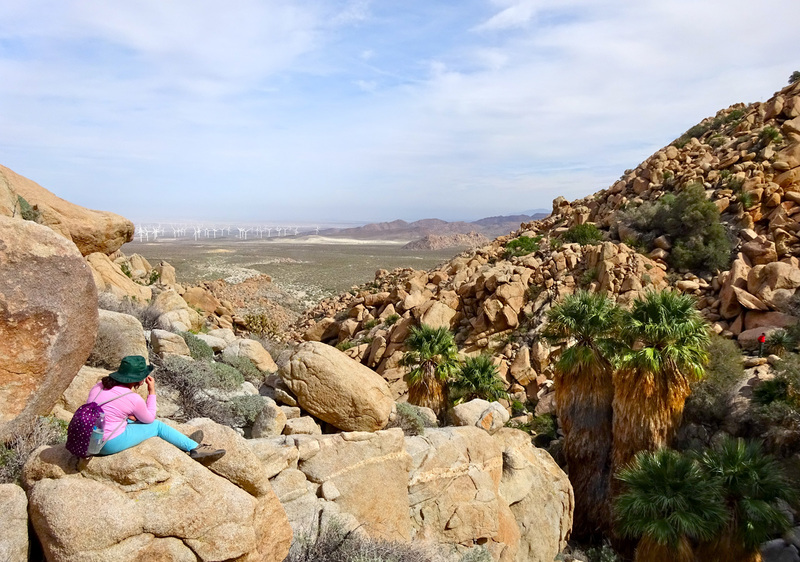 But there were incredible views to be had all around, from the rock formations forming walls to either side, to the fields of golden cholla cactus marching into the distance. 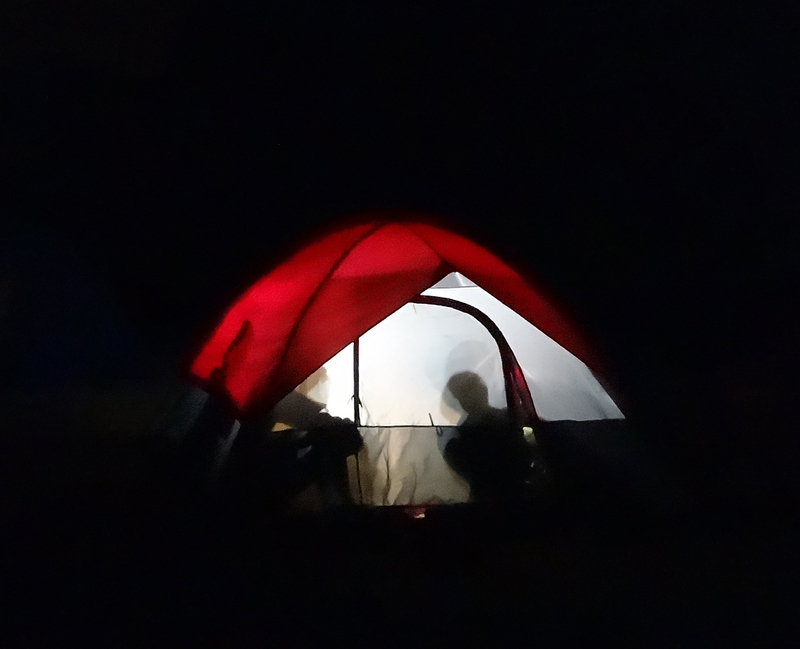 The shadows started to lengthen, and it was time to head back to camp. Night falls fast in the desert, and we had to start thinking about dinner. Back at camp we took a moment to appreciate Andrew’s Clint Eastwood impression. …I hiked up the hillside with a few boys for a look at the sunset. It wasn’t full of spectacular color, but the muted pinks and blues were still quite pretty. And the landscape was awesome. We ate great food, hung out around the fire, and tried to watch for Geminid meteors, but with an almost full moon, it was challenging to spot them. After 2 hikes, a huge dinner, and a few hours of chatting by the fire, I hit the hay. And that’s when the miracle happened. I actually got a good night’s sleep! For the first time in forever when camping!! Yeah for me!!! Scouts cooking with the patrol boxes; boys with grilled cuties. 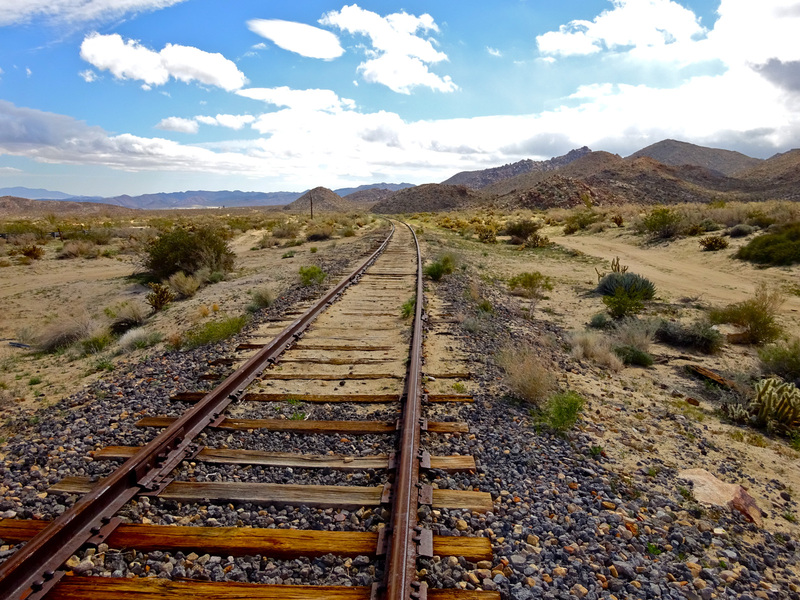 …and we drove to our last desert adventure of the trip, a visit on the way out to an abandoned railroad station. 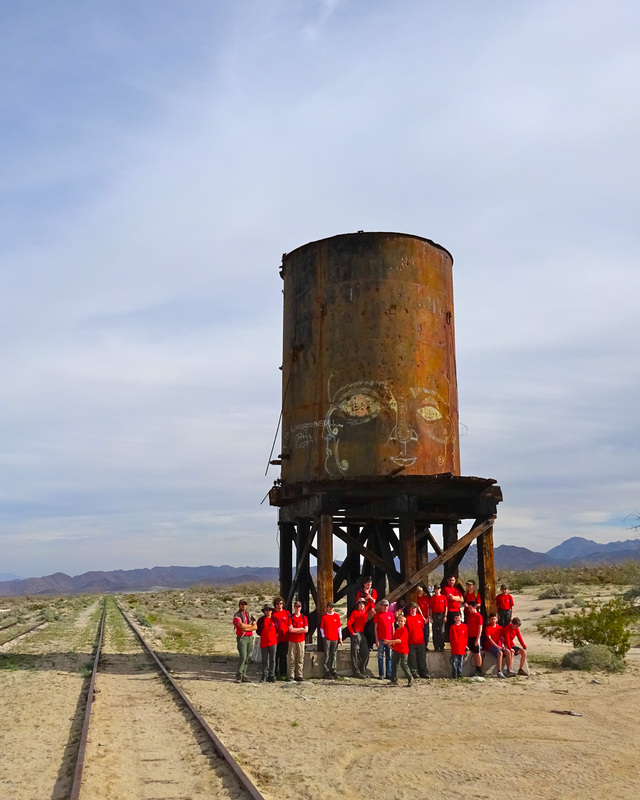 The building was torn down awhile ago, as it was deemed hazardous, but the foundation remains, along with an old water tower, and, of course, railroad tracks. 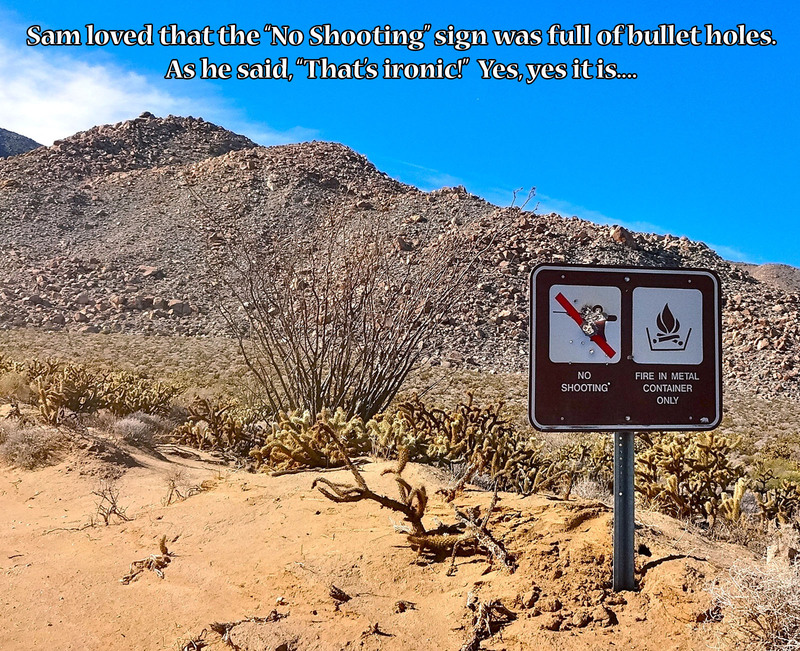 Before we left camp we got a picture of the “No Shooting” sign, which was full of bullet holes. Sam thought this was very funny. 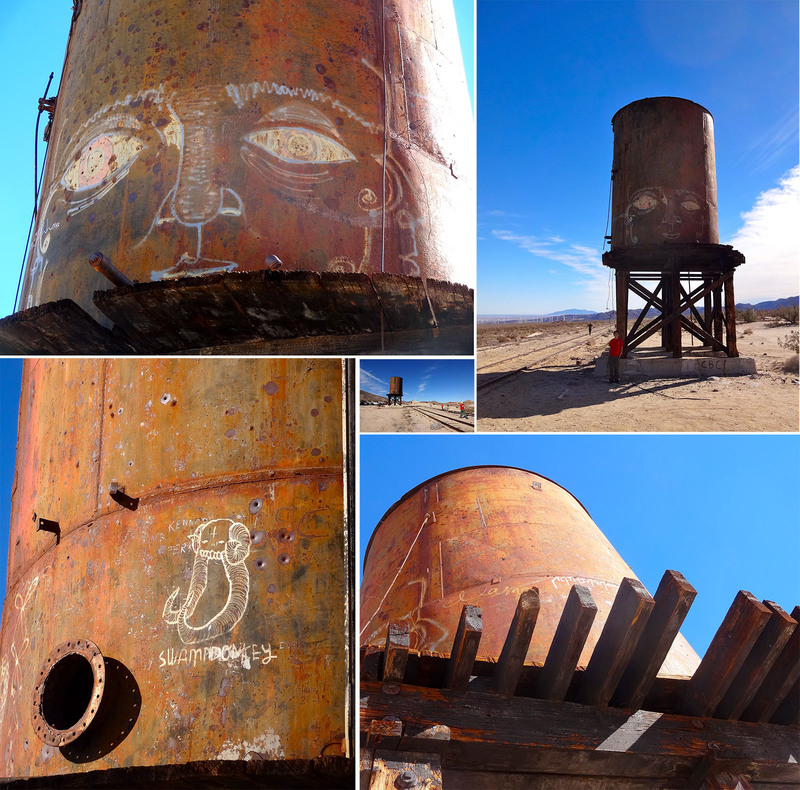 Water tower at the abandoned railroad station. 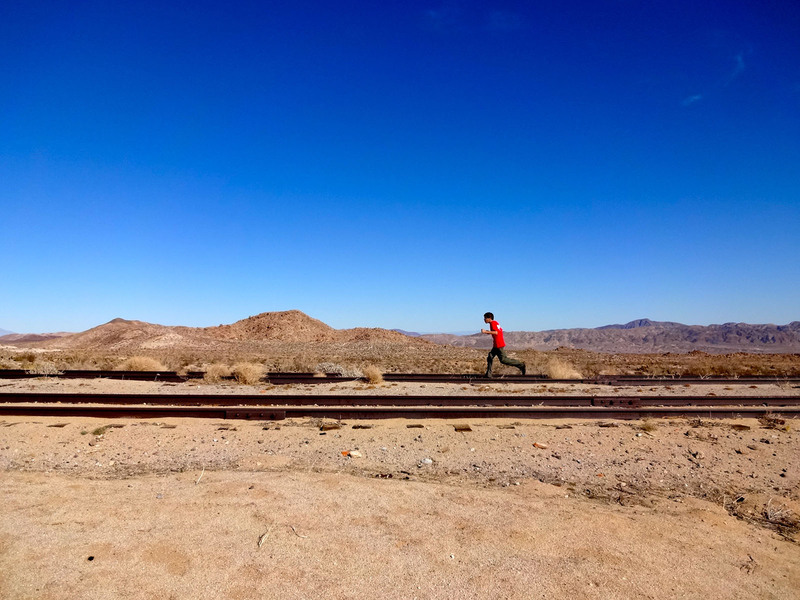 Sam running down the railroad tracks. It is pleasant to get home from these trips and take a hot shower, put on clean clothes, and check my email. But I always think about the places we left behind, as I am lying in my comfy bed, wondering about the quiet nights and hot days, the rocks and plants, and the big sky. It’s nice to think back and know it is all still out there. 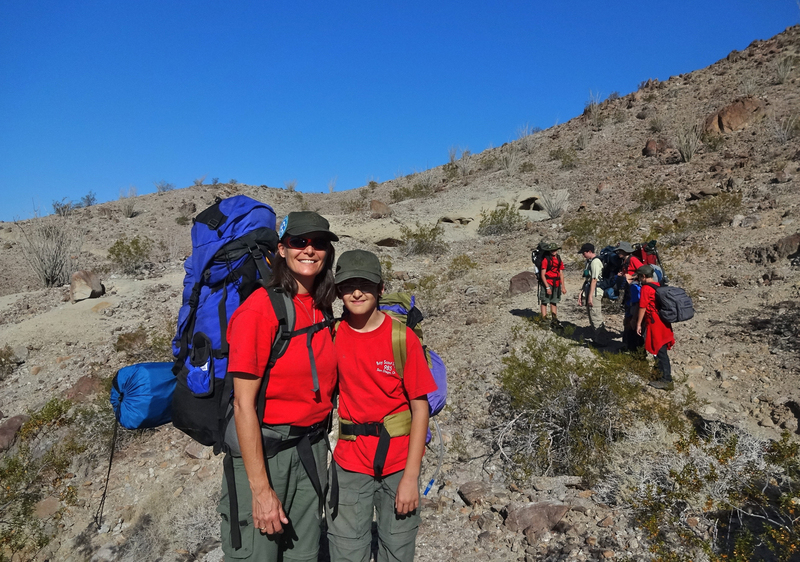 Fall is here, and that means camping season with my son’s Boy Scout troop has begun. 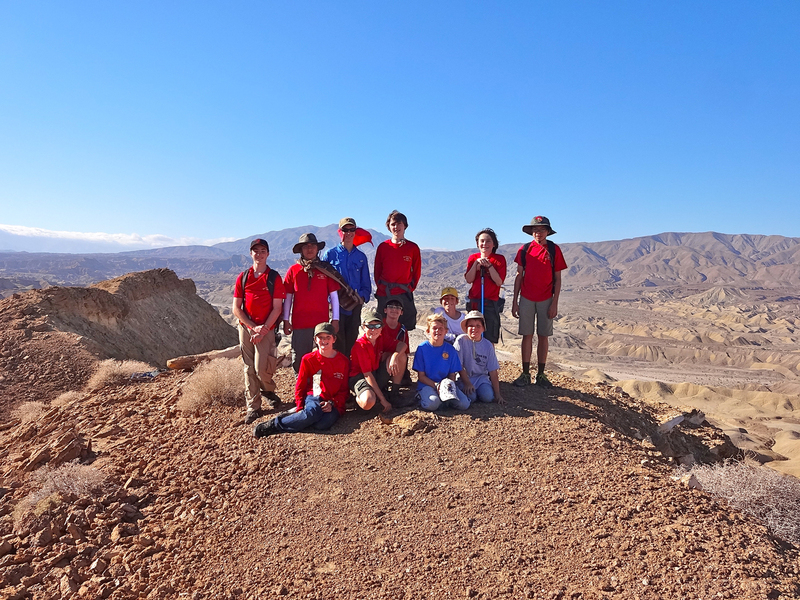 For our first outing the troop headed east, to the Wind Caves in Anza Borrego State Park, about 100 miles east of San Diego. We were due to set out early Saturday morning and stay overnight. Wednesday and Thursday were absolutely gorgeous in San Diego, sunny and warm, perfect weather. Then on Friday the clouds rolled in. And I’m thinking, of course, it’s going to rain. Because we are going camping. Saturday arrived, cold and overcast. We hopped in the cars and headed east. This is the view from my friend Tony’s windshield, as we were making our way over the Laguna Mountains. Foggy, rainy, and an outside temperature in the 40’s. 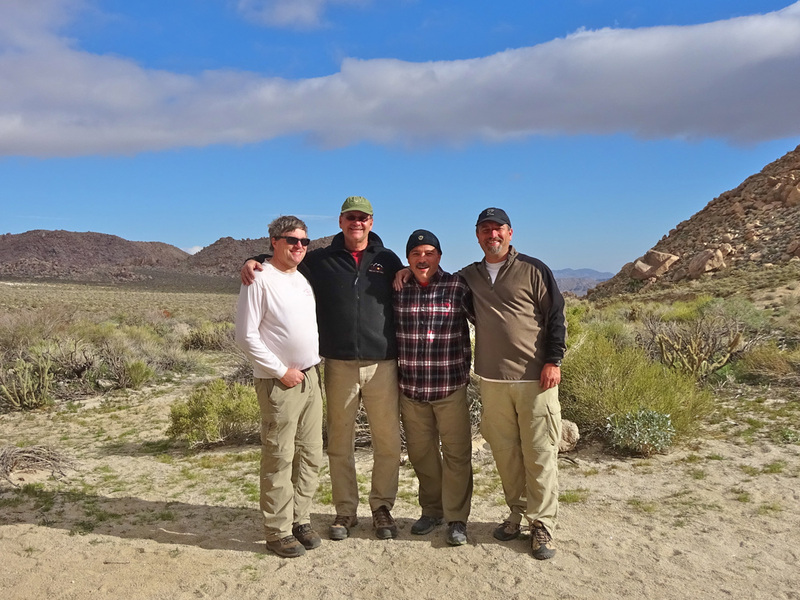 I was having a flashback to a desert camping trip the troop did last year. The view out the windshield on our way out then was not rain, but snow (see post http://samscout.wordpress.com/2013/01/11/desert-camp-out-a-rainy-windy-rocky-adventure/). If you look very carefully in the last panel above, through the raindrops, you can see a bit of clear sky. 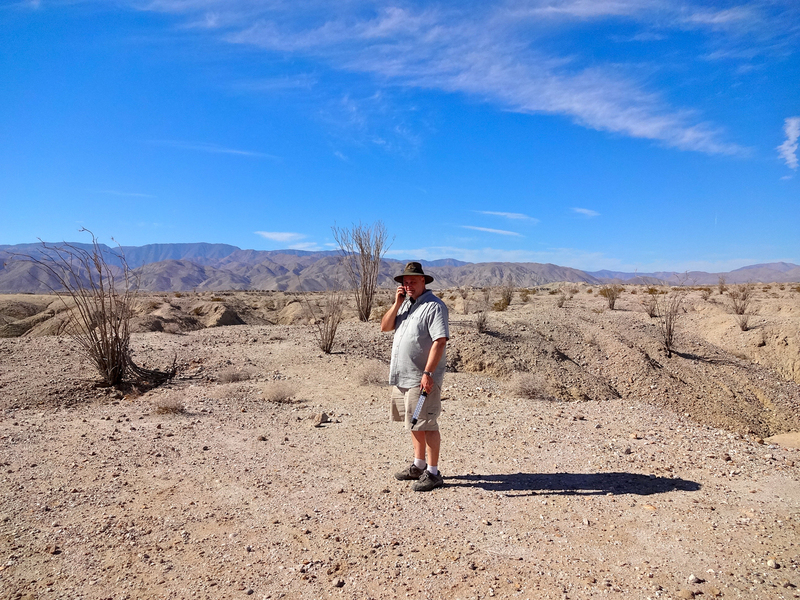 And if you can believe it, in about 20 minutes we were out of the rain and fog, with blue skies and sunshine overhead as we hit the desert floor. 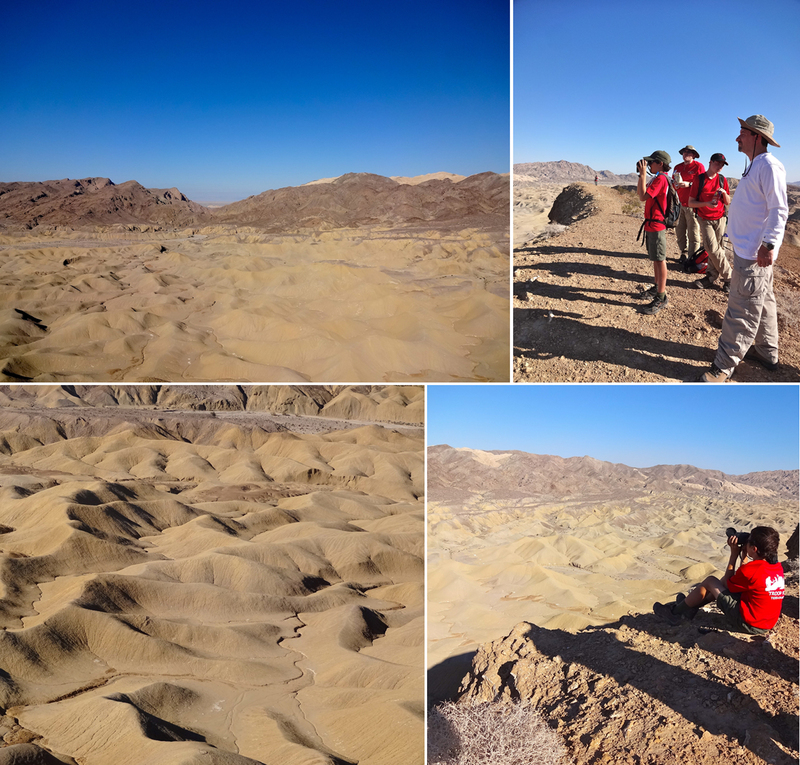 The geology was really interesting, with bulging, lifted layers of sedimentary rock pointing in all different directions. 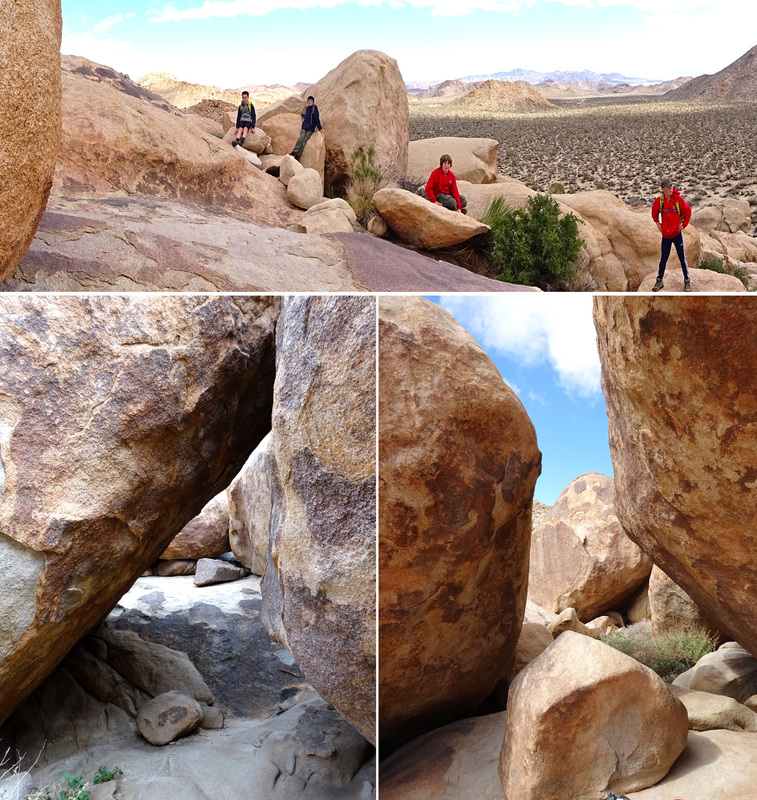 There were huge boulders sandwiched into the layers at random places, some of which we drove directly under. Hope you aren’t in the car underneath one of those boulders when it finally erodes its way out of the rock wall. We worked our way into the park, our destination the trail head for the Wind Caves. 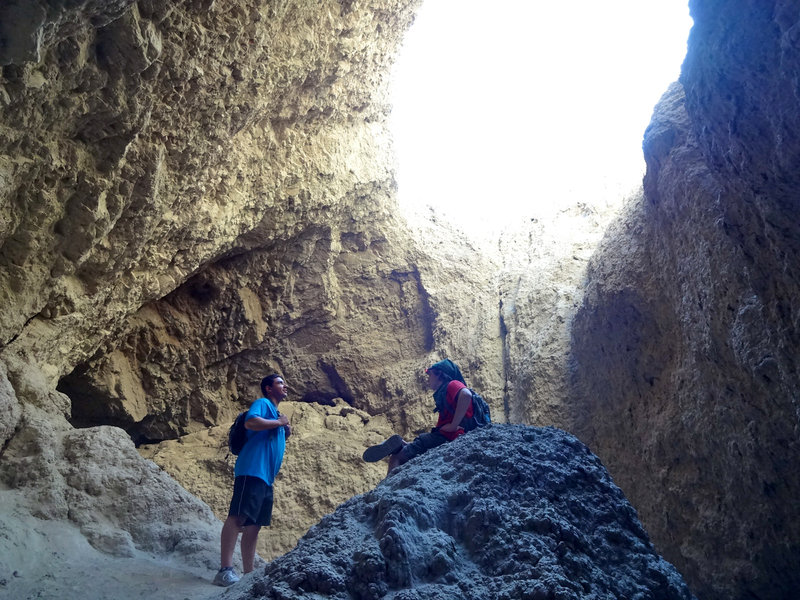 The hike up to the wind caves is less than a mile, with an elevation gain of a few hundred feet. 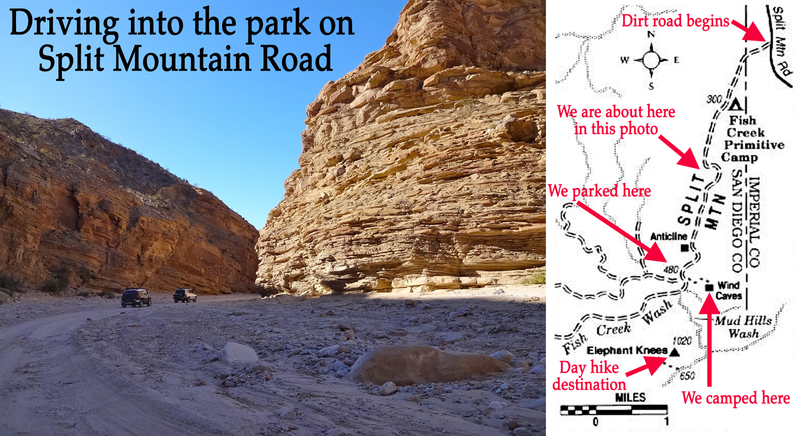 We shouldered our packs, as we planned to spend the night sleeping in the caves, and headed up the trail. 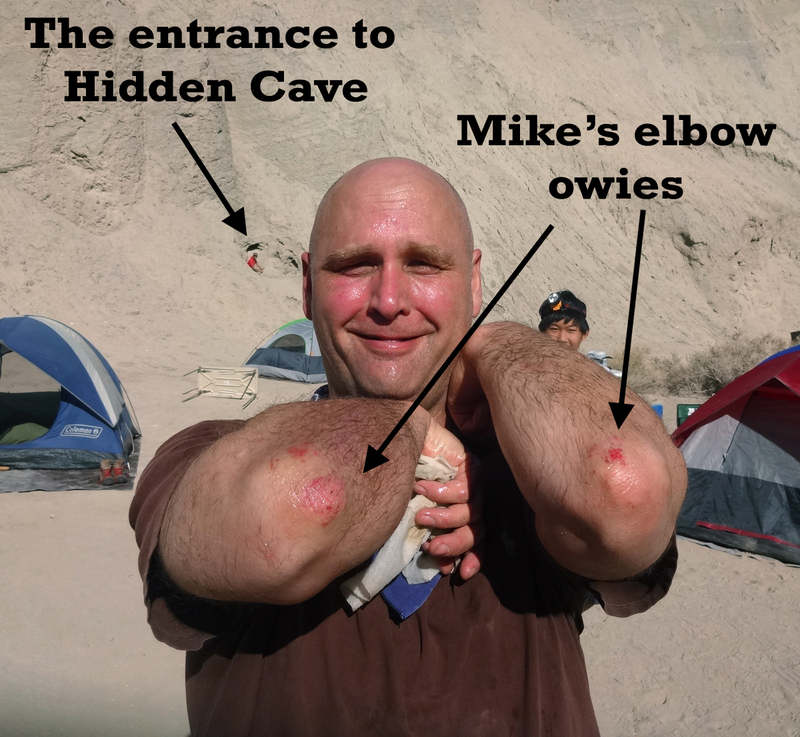 When we arrived at the Wind Caves it was a free for all, as everyone scrambled to find a cave. Sam and Matthew, our two scouts, snagged this beauty for me and Tony. Thanks boys! 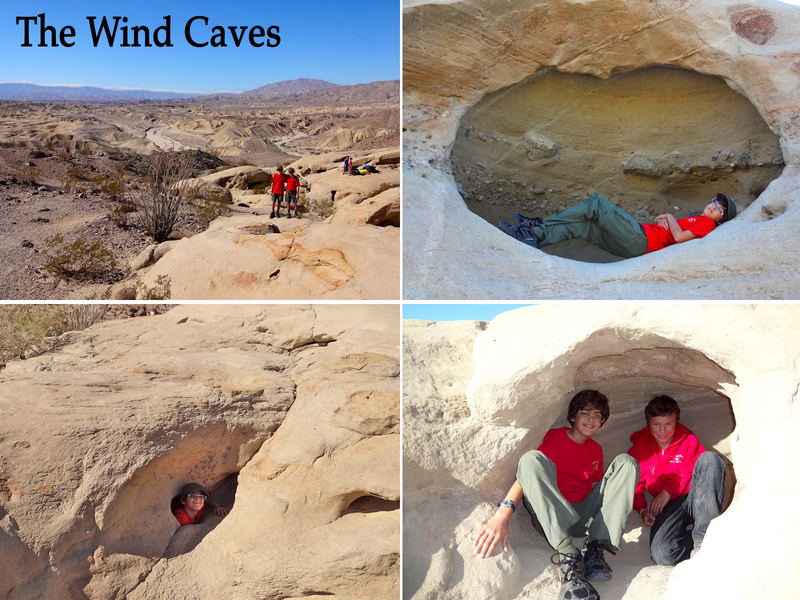 The caves, tunnels, and alcoves have been eroded out a sandstone formation by the wind. 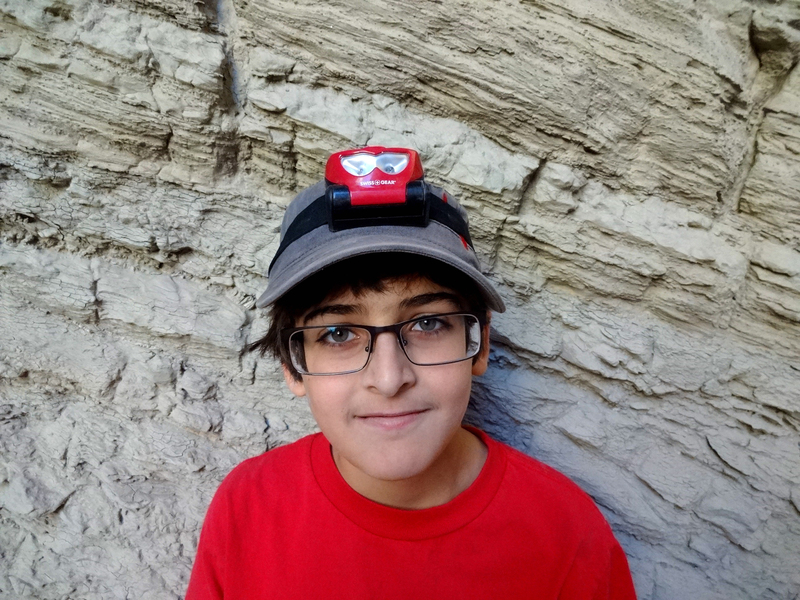 The scouts had endless fun scrambling around the caves, poking their heads out of holes, and even playing a moonlit game of hide and seek later that night. 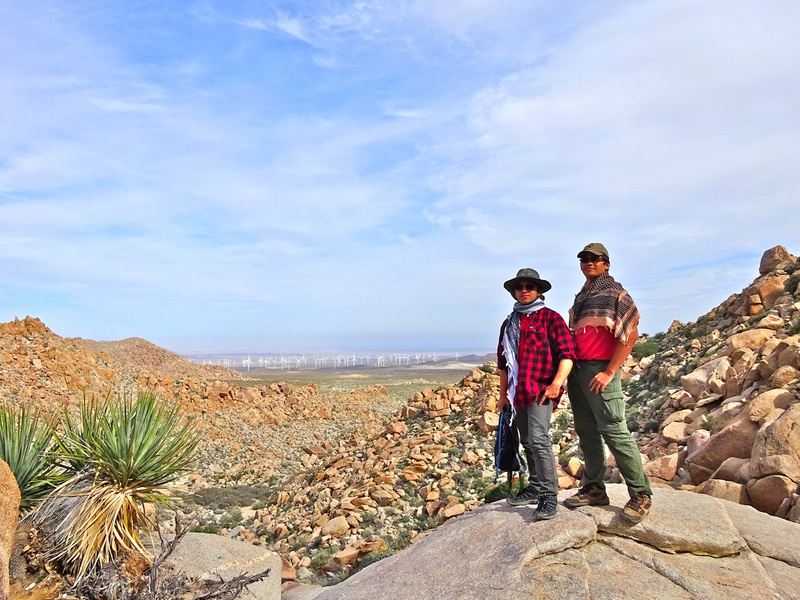 The view out over the Anza Borrego desert was incredible. Mountains in the distance, and in front of those the Carrizo Badlands, washes, and a formation called the Elephant Knees. 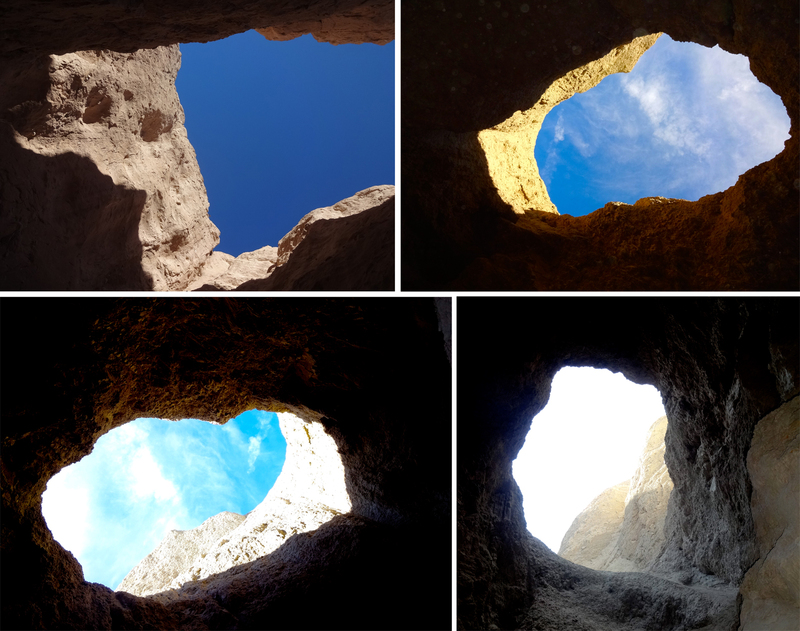 Here are a few panoramic pictures of the view looking out from the caves. 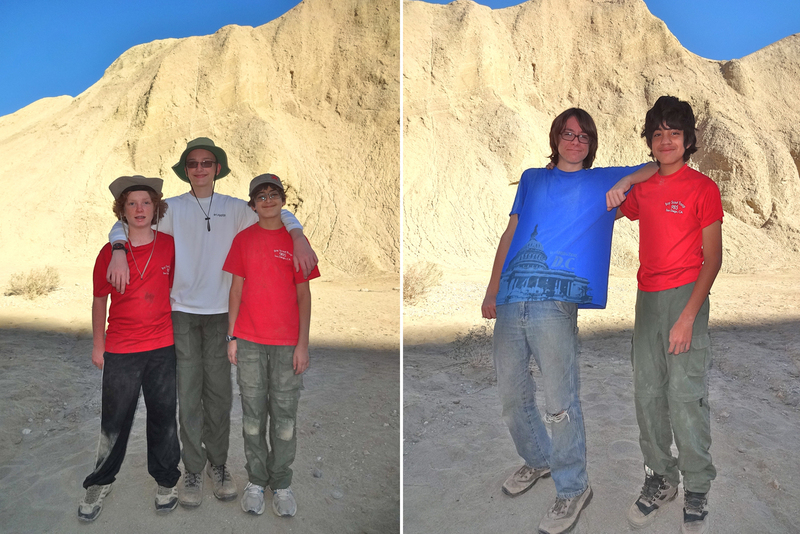 Matthew is posing in the bottom photo, looking like he is part of an ad campaign for the Boy Scouts. Now for some geology! 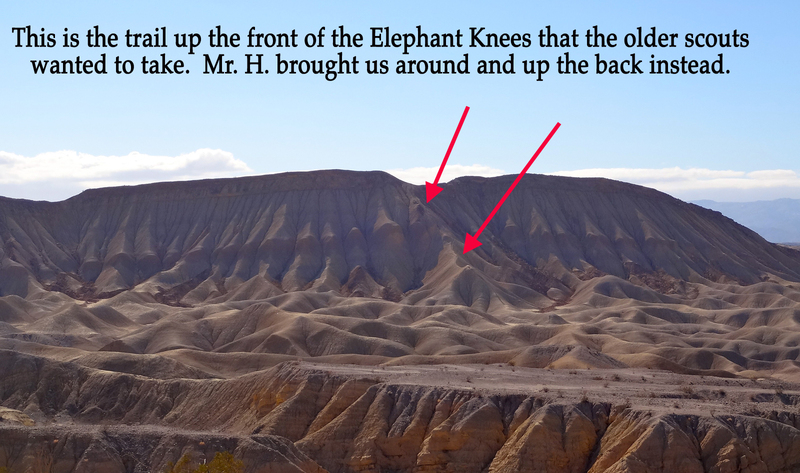 Those flat hills in front of Matthew are called the Elephant Knees. 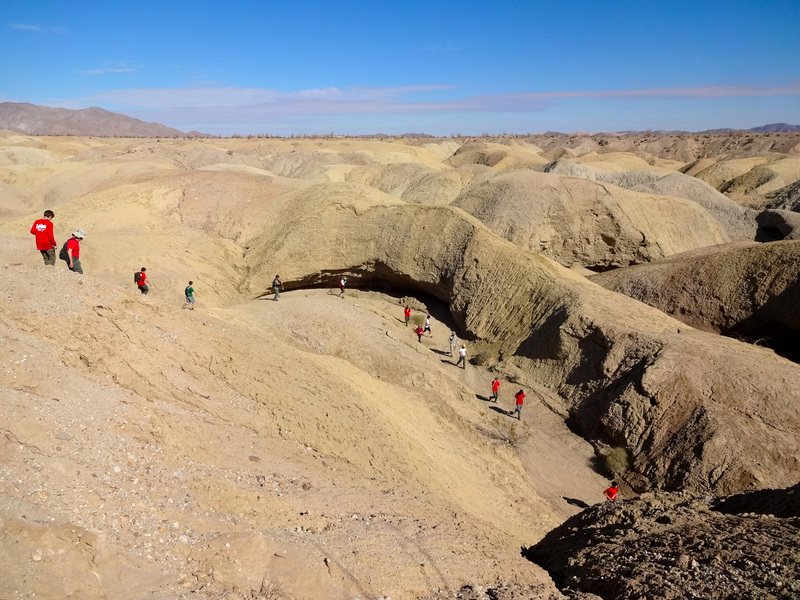 They, and the badlands and mudhills that we will hike out into later are the remains of a tropical sea that existed here from six million to under a half million years ago during the Pliocene and Pleistocene epochs. 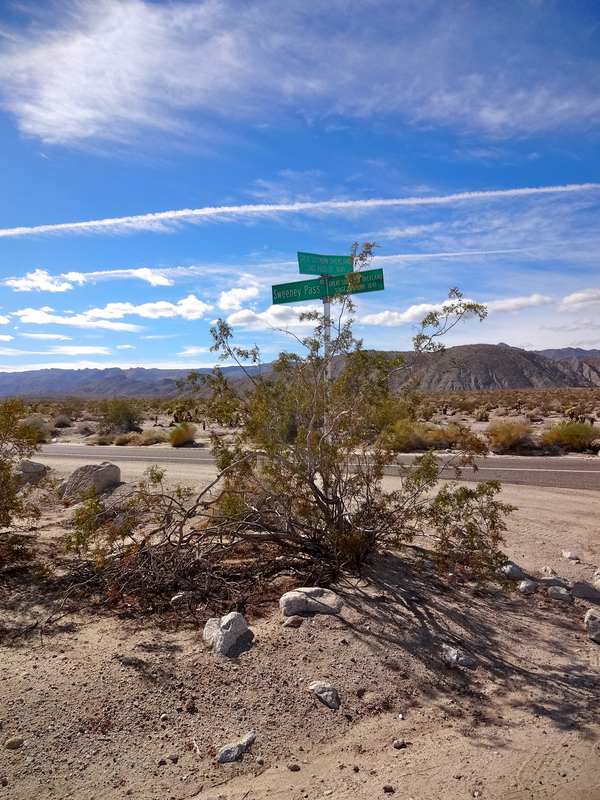 The park has many fossils that illustrate the quite different habitat and life forms that used to live in what is now a desert. The fossil record from the park includes many marine invertebrates (clams, oysters, sand dollars, sea urchins and corals) vertebrates (sharks, rays, bony fish, and baleen whales) as well as terrestrial vertebrates like mammoths. The marine environments that were fossilized are part of the ‘Imperial Formation’, and are made up of shelves, reefs, beaches, and lagoons. As the seas became more shallow over time, estuarine and brackish environments prevailed, and the Elephant Knees formation is made up of thick deposits of oysters and pecten shells from this ancient environment (thank you Wikipedia). After lunch we headed out on what would turn out to be a 7 mile day hike out to Elephant Knees and back. 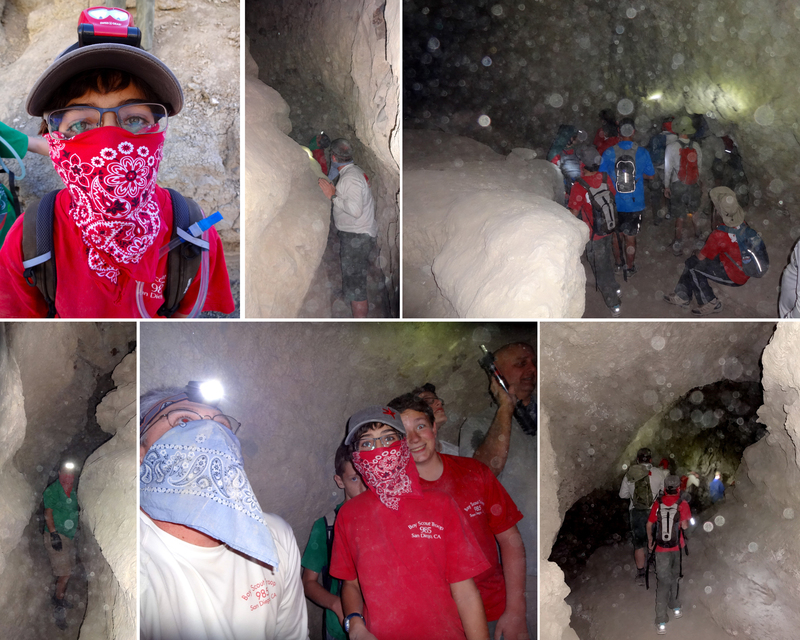 Andrew, Ted, and a few of the older scouts wanted to take the trail straight up the face. Mr. H., our scoutmaster, opted to go around the back instead. Have a mentioned how much I like our Scoutmaster? 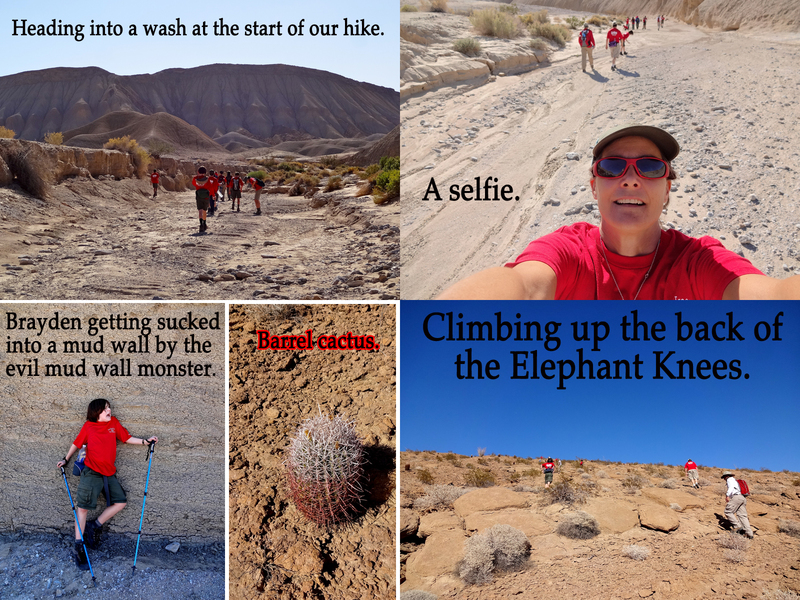 We made our way to the backside of the Elephant Knees and then up, up, up, past barrel cacti and creosote bushes. The rock was pretty easy to walk on, it was grippy and sharp and all glued together. The view from the top behind the Elephant Knees into the badlands was spectacular. The Y-shaped wash you can see is on the map at the beginning of this post. We hung out at the top for a bit. We drank water, had some snacks (Ted brought Oreos! 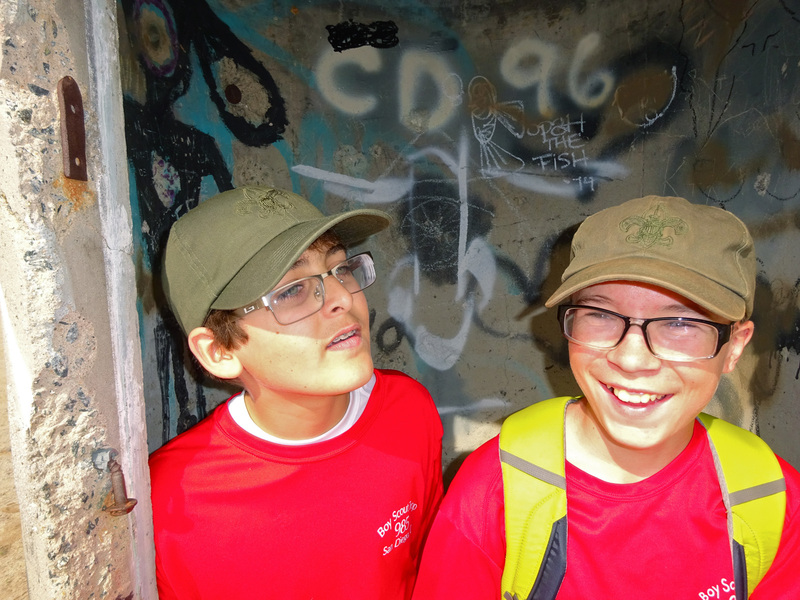 ), the boys threw about a million rocks over the edge, and Mr. H. got out his binoculars. 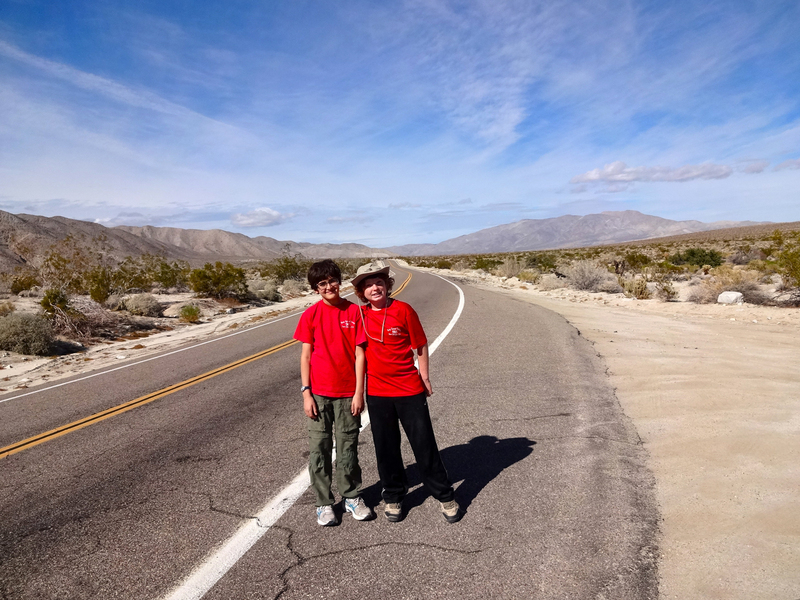 We posed the boys for a photo near, but not too near, the edge. 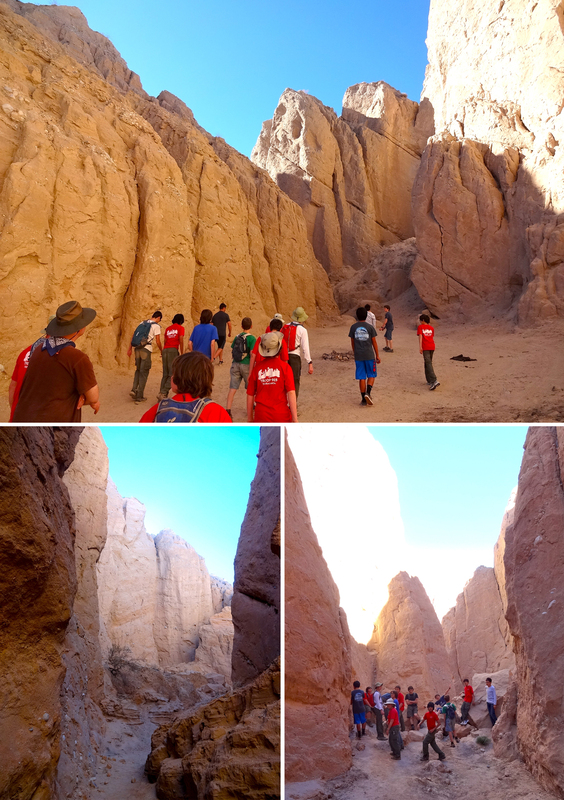 The upper left panel shows the view back towards our camp at the Wind Caves. Scouts on top of the Elephant Knees. We got back to camp at around 4:30, and we set Matthew and Sam to cooking dinner, as they were working on finishing one of their rank requirements for 2nd Class. They wanted to run off and play, but Tony and I insisted they cook while we still had daylight, which I hope is a camping lesson they remember. Everything is easier when the sun is up! As promised in the title to this post, a desert sunset. The sun went down behind a bank of far away clouds. Venus was amazingly bright, as the last light from the sun faded. 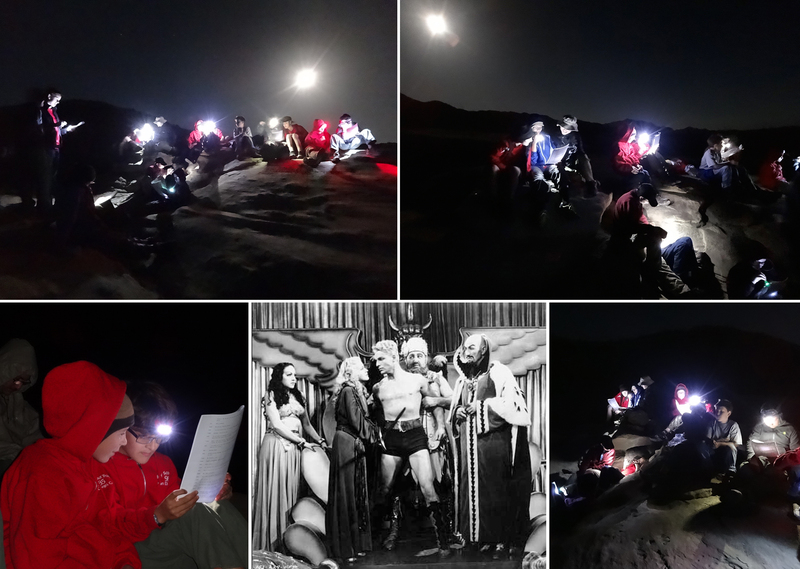 After sunset, dinner, and the moonrise over the hills behind us, Mr. H. gathered the boys on top of one of the sandstone formations for a dramatic reading of Flash Gordon. He found scripts from two old radio episodes on the internet, and we were all regaled by the adventures of Flash, the delectable Dale Arden, the evil Ming the Merciless, Flash’s friend Prince Thun the Lion Man of Mongo, and a host of other characters. Listening to the adventures of Flash Gordon, under the desert moon. After Flash Gordon, the group scattered. Some scouts started up a game of hide and seek under the light of the full moon. It was amazingly bright, but running around, especially after hiking for 4 hours, was not on my itinerary. The adults sat for awhile star gazing and chatting, then gradually headed off to bed. 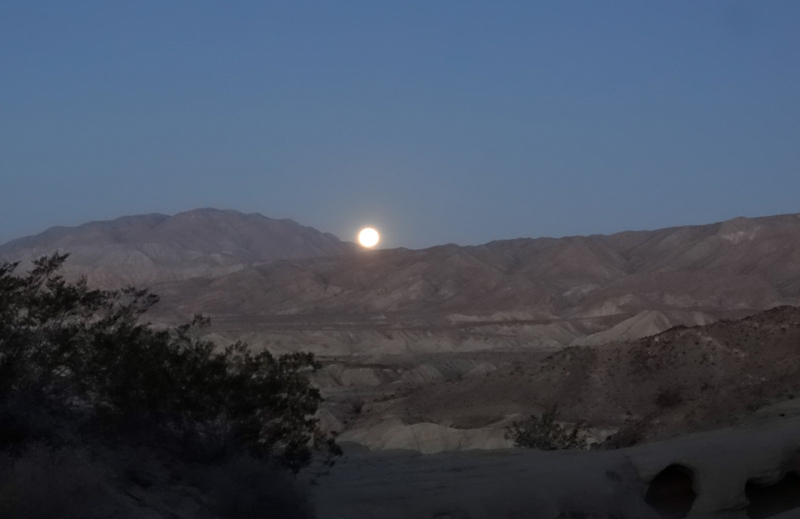 I don’t sleep terribly well when I am camping, so I got to see sunset, moonrise, moonset (took the picture below from the snuggly comfort of my sleeping bag), and sunrise. That has never happened to me before! The rising sun lights up the mountains, behind which the moon just recently set. After breakfast we packed up, gathered for some final words and a group photo, and got ready to head back to civilization. Me and my favorite scout. 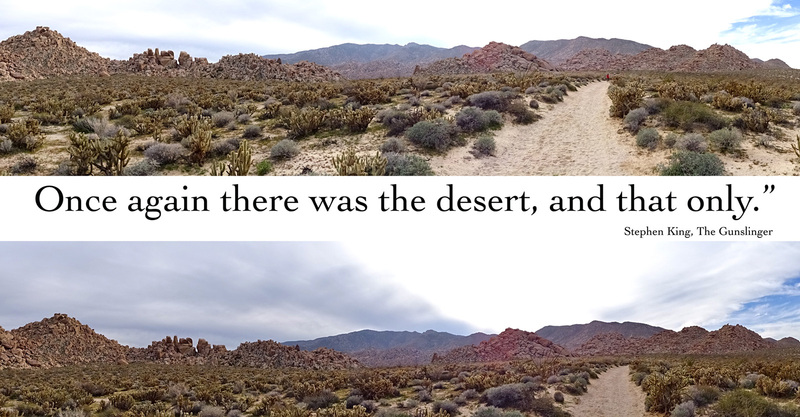 Until next time, we bid farewell to the quiet beauty of the desert. 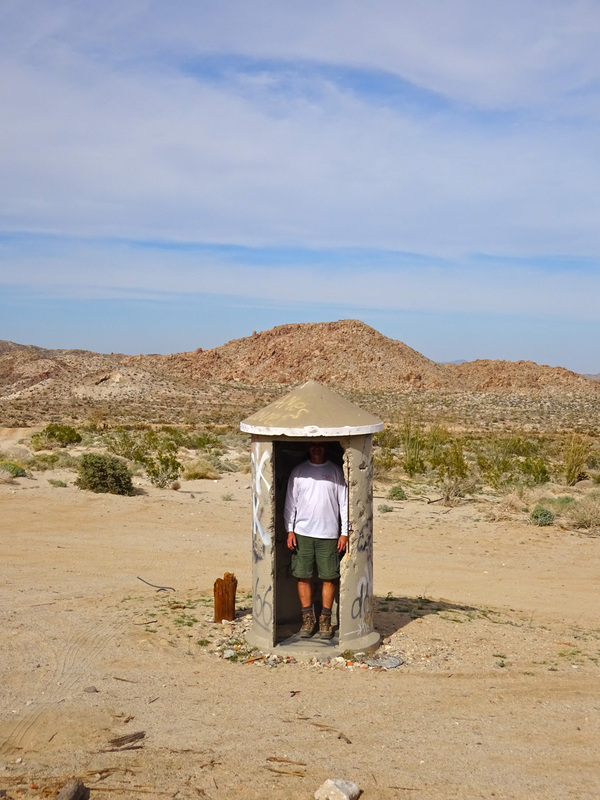 Mr. H. took this video as we drove into the desert. It gives an idea of the wild scenery we enjoyed all weekend. 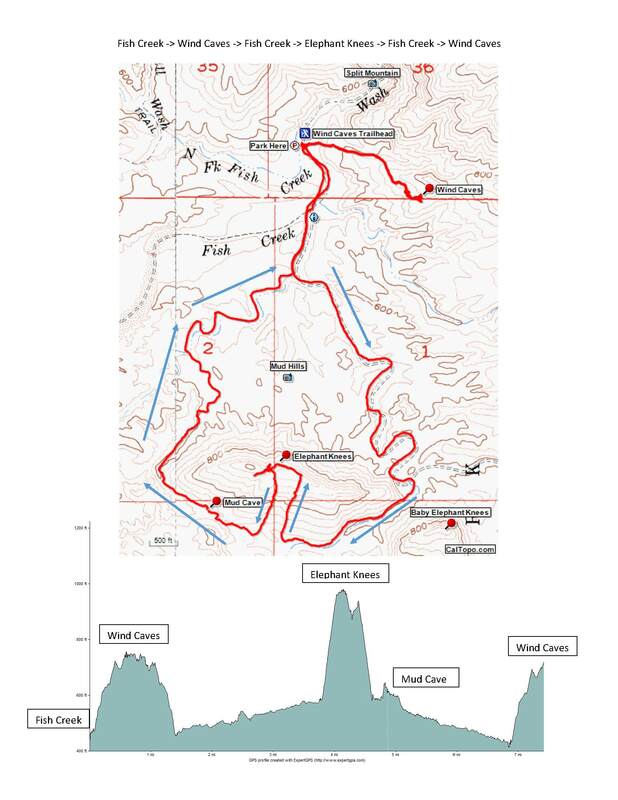 Also, Mr. H. took his GPS info and created this map and graph of our hike.